We started our tour rendezvousing at a hotel in San Antonio. As a Californian transplant I had already missed out on a couple of highlight species that the group had picked up in the parking lot: Blue Jay and Common Grackle. 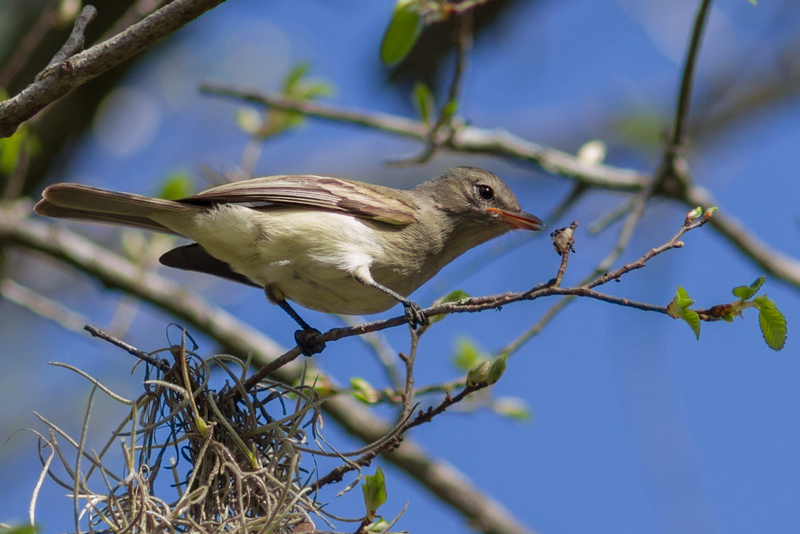 We were quickly on route, winging it eastwards to Warbler Woods in Guadalupe County. Not having been there before, and with no clues on eBird or the listserve, it wasn’t clear that this site needed some pre-arranged clearance to access the site. We therefore arrived at a frustratingly locked gate, not the ideal start to any tour. Luckily a couple of texts and a phone call later to Texan friends meant we were soon through the gate and enjoying some birds. Phew! There were a couple of reasons for the stop here but mostly I had hoped that we might pick up a rare Golden-crowned Sparrow here though I was almost as excited to try see a more expected Harris’s Sparrow there too. As we walked out to the feeder set up there were other birds to enjoy along the way including a life birds for most involved: Black-crested Titmouse. It was a little quiet at the feeders, but we were soon eking out birds including nice looks at Inca and White-winged Doves. The feeders held a nice mix of sparrows with Lincoln’s, White-crowned, Field and after some wait a beautiful Harris’s appeared in the mix. We also added a couple of nice “western” birds in the shape of a Spotted Towhee and a Red-naped Sapsucker – I’ll await the email from the ebird reviewer about that one in 2019. After picking up some Northern Bobwhite and with the day rolling on we eventually cut our losses on the Golden-crowned Sparrow and worked our way south ready for the next day. We ended our night in Three Rivers, TX which boasted some decent Mexican food and a rather average Rodeway Inn. We had positioned ourselves in Three Rivers to place ourselves centrally, either to strike out eastwards to look for a returning Golden-crowned Warbler or westwards in the hunt for seedeaters and pigeons in Laredo. With a sighting of the intermittently witnessed Golden-crowned Warbler the day before we decided to give it a shot. The park in Refugio had been pretty banged up by Hurricane Harvey and lots of the site was even less accessible than last year. Though we had lots of nice birds at the park including Great Kiskadee and Golden-fronted Woodpecker it was a pair of beautiful Green Kingfishers that were vocalizing and chasing each other up and down the creek that really stole the show. In the end we left the park without another Golden-crowned bird species, a little disappointing, but not through lack of trying. As we cruised across country there were lots of birds to enjoy and drive by stops included nice southern raptors like Crested Caracaras and a Harris’s Hawks. We found ourselves back in Three Rivers where a stop at Choke Canyon State Park helped us pick up a few new nice Texan species including our first stunning Green Jays. Though the jays are always scene stealers, there were lots of other enjoyable birds including some mixed passerine flocks that contained Black-and-White Warbler, White-eyed and Blue-headed Vireos. There were a couple of other nice Texan specialties too including great looks at often skulky Olive Sparrows and Long-billed Thrashers. After putting a few more miles on the clock and a stop at the world’s slowest Subway we ended our day at the Max Mandel Golf Course. We worked hard for White-collared Seedeaters without joy, but as the day ended we were treated to the sights and sounds of a pair of Ringed Kingfishers roaming up and down river. Just as I was starting to wonder if we were going to end the day empty handed I spotted a group of a dozen Red-billed Pigeons across on the Mexican side of the river. The pigeons then flew across the river to the US side allowing us great binocular views and even a couple of photos. 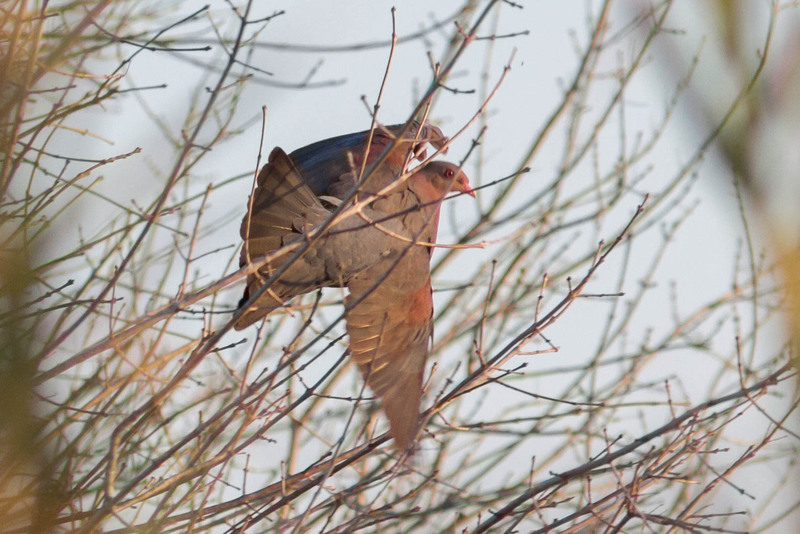 Red-billed Pigeon must rate as one of the hardest regularly occurring species in Southern Texas so any sighting is good, but one where the birds come to join you on the US side of the river is pretty special! A magical end to a long day right down on the Mexican border was rounded out when a Barn Owl flew slowly by the car as we drove back into Laredo. With Red-billed Pigeon under our belt, our next target along the river was White-collared Seedeater another potentially tricky specialist species. Where the last couple of days we had worked hard for our birds this morning everything was running smoothly again. A short hike along the river at Salineno soon garnered us several neat birds including a female Vermilion Flycatcher (which made for a nice ID challenge) and a couple of pretty Clay-colored Sparrows. Most excitingly in among the sparrow flocks we soon located a couple of spiffy little White-collared Seedeaters, first a young male gave good looks before a female put on quite the show as she perched in a nearby tree. We even managed to direct a group from the local state park onto the birds. 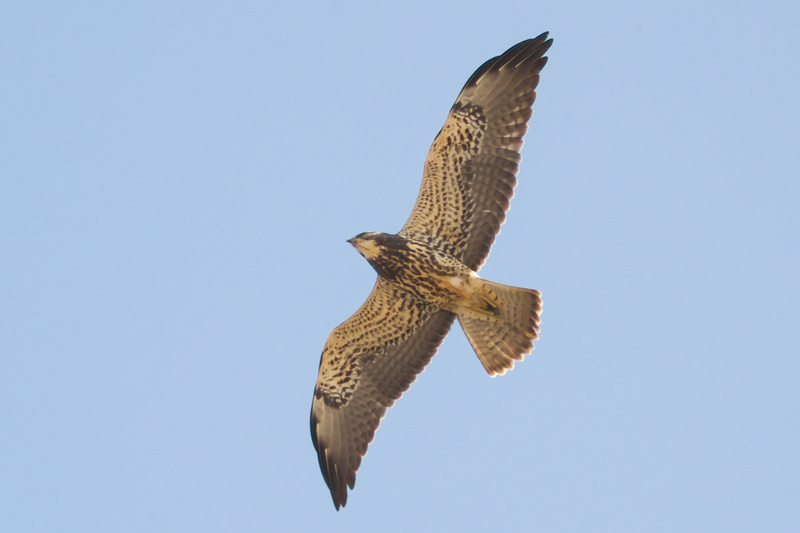 As we walked back to the feeder setup that Salineno is famous for I was mentioning the need to keep our eye open for Zone-tailed Hawks when I looked across the river to see a Zone-tailed Hawk soaring over the river. Ask and ye shall receive – or something like that. Another nice and potentially tricky bird on the list. Settling in at the feeders at Salineno is always a pleasure. 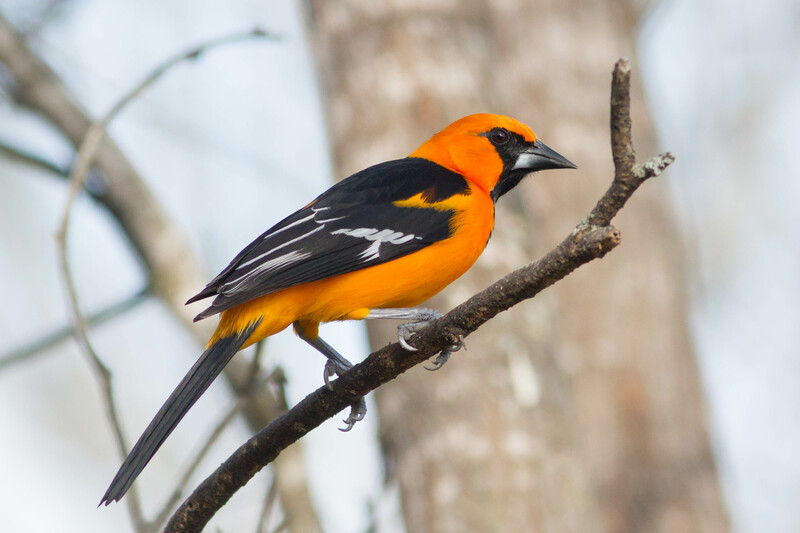 With lots of great birds to be enjoyed including potentially difficult to find ones like Audubon’s Oriole, and others that can just be tough to see in many places like Plain Chachalaca, Olive Sparrow and Clay-colored Thrush. Amazing to think that it was just a few years ago that the thrush was a mega rarity and now it is an expected, if not always easy to see, South Texas specialty. Just spending time at the feeders at Salineno and reveling in the common birds there is one of the great joys of the Rio Grande Valley, sad to think that it could end up on the wrong side of a border wall. 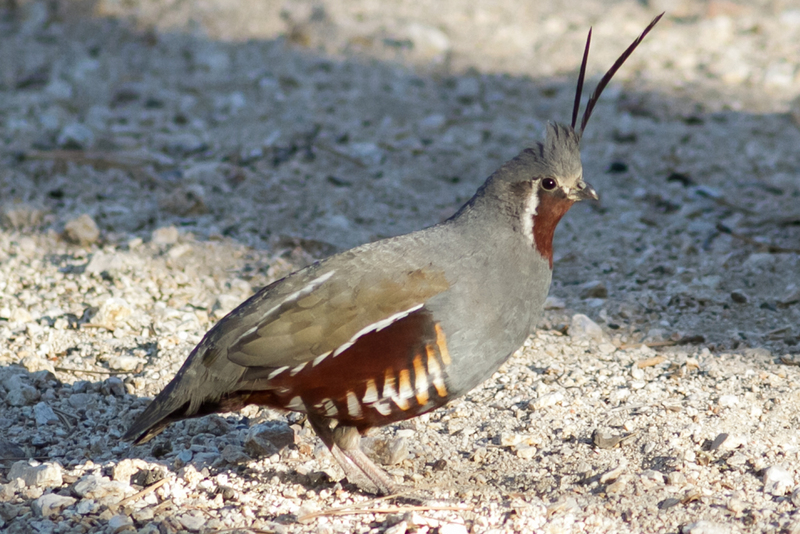 As we high-tailed it out of town, the birding gods were again on our side as a covey of Scaled Quail noisily moved through the cactus and desert brush as we slowed down to check out a small passerine that had zipped across the road. Scaled Quail are tough at any time in this part of Texas, so the appearance of these charming cottontops was a real treat. Starr County Park wasn’t particularly productive, though a pale soaring Red-tailed Hawk was of the pretty and range-limited Fuertes’s subspecies and a Lark Sparrow was a treat. On the other hand Zapata Library Park was quite birdy and we turned up a nice little flock of passerines including both subspecies of Yellow-rumped Warbler, Black-throated Gray and Black-and-White Warblers. 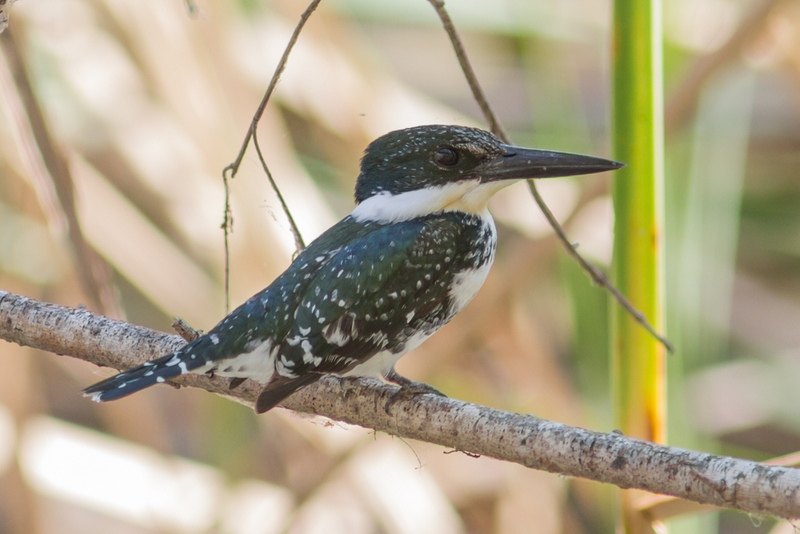 A cooperatively photographable Green Kingfisher also added to the fun. After lunch we stopped in at Zapata’s Public Boat Launch. This is a spot that I’ve always liked for dry habitat species. It certainly didn’t disappoint, with Pyrrhuloxia, Black-throated Sparrow and Verdin all putting in an appearance. I also love this spot for the boisterous Cactus Wrens, who use the bandstand structure here to amplify their already ample voices. 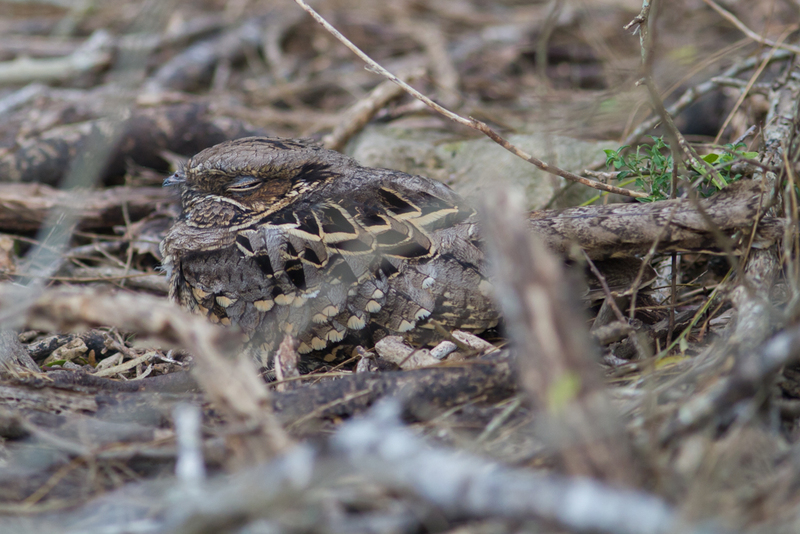 Highlight though had to be flushing a small, short-tailed nightjar from the ground a couple of times. Though views were brief, it was easy to rule out Pauraque and identify this as a rare and exciting, for the area, Common Poorwill. A nice and unexpected addition at a spot I feel I have at least played a small part in championing. Next stop was another spot that I had eyed up initially on google maps and wanted to explore. At a little pond in Rio Grande City we eked out a handful of great birds including a beautiful Ringed Kingfisher, but more excitingly a stunning Scissor-tailed Flycatcher. A great spot of a much desired, but often tough to find, species during winter. Even with all the great sightings, this bird was our official bird of the day! An incredible run of good birds was rounded out with us enjoying a rare White-winged Parakeet among the usual McAllen Green Parakeet flock. Weirdly though, the expected grackles were something of a no-show. We ended our day at a great local restaurant where they were serving perhaps two of my favorite beers of all time: Avery Maharajah IPA and Founders Breakfast Stout. A fitting end to a great day. You can’t really go to the Rio Grande Valley without visiting Bentsen, though I often wish I had. Not only was it resoundingly quiet during our visit, it also meant that we just missed a Blue Bunting sighting at Quinta Mazatlan by a few minutes on our arrival there. After we had stuck around for a couple of hours searching fruitlessly we decided to cut our losses and head for pastures new: a change is as good as a rest. A quick look for Burrowing Owl wasn’t productive, so we moved on to Anzalduas to look for Sprague’s Pipits trying to get something in the bag. With us only being a small group, it was something of a relief to find a couple of stray birders from another tour group that were looking for the Sprague’s Pipits that they’d missed on their Texas tour. We quickly put them to use forming a manhunt style dragnet to sweep the field at Anzalduas and thankfully we soon tracked down three or four of our quarry. We first got nice looks at their distinctive flight style before eventually getting decent scoped views of a bird on the ground. With our birding luck seemingly changing we headed back to Quinta Mazatlan and we were relieved just a few minutes after arrival when the Blue Bunting put in another visit to the bushes behind the feeder. I’m not sure I’ve ever been quite so relieved to see a bird! 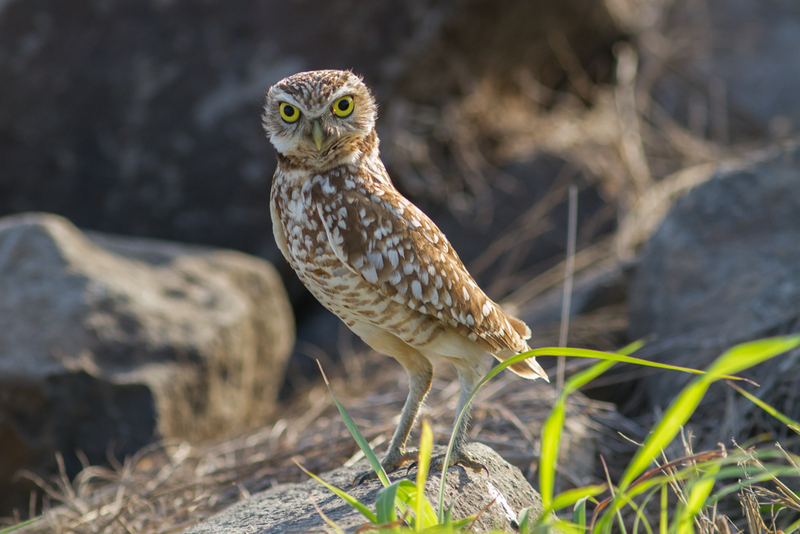 With that success under our belt we headed back out to Granjeno where the Burrowing Owl obliged us with an amazingly point-blank appearance. A day of tough birding and persistence finally rewarded by several excellent birds. We ended our day a little early heading for a fun evening at a neat barbecue joint that I love. We started our day at a Rio Grande Valley gem: Estero Lllano Grande State Park. To my mind this park is the premier large park in the valley with a range of great habitat and great birds. The place certainly didn’t disappoint with lots of great species quickly racked up: Least Grebe, Roseate Spoonbill, Buff-bellied Hummingbird, White-tailed Kite and more. Highlight there had to be the opportunity to get up close and personal encounters with roosting Common Pauraque and our encounter this year did not disappoint. There was also a huge number of Yellow-crowned Night-Herons at a communal roost and some Black-crowneds and a Anhingha thrown in for good measure. Next stop was at Progresso Lakes a little community that had been hosting both Black-bellied Whistling Ducks and occasionally a Fulvous Whistling Duck too. We arrived at the spot and pulled up on the side of the road to scan through what looked to be a good few hundred whistling-ducks. As we were setting up our scopes the owner of the house came out, and to my surprise asked us if we would like to head out to the back edge of their yard to get a better look at the assembled birds! As we rounded the corner of the house we were amazed to discover that the couple of hundred whistling-ducks we could see had multiplied into a couple of thousand! We sifted through this mind-blowing collection of ducks, eventually picking out four Fulvous Whistling-ducks which we would never had seen from the public road! Amazing! Our continued morning run through Progresso allowed us to pick up a couple of other exciting new birds including some Cattle Egrets in a nearby cow field (surprise, surprise) and down at some local grain silos an incredible collection of blackbirds that included stunning Yellow-headed Blackbirds. The grain silo experience was a remarkable one, with thousands of birds swirling around the property and among the mainly Red-winged Blackbirds a few assorted other goodies like Bronzed Cowbird. An opportune stop at a recently burned sugar cane field yielded a couple of White-tailed Hawks, our first completely satisfying looks at this species. After a great lunch at my favorite lunch spot in the valley, Nana’s, we moved on to Santa Ana. With the wind picking up, the birding conditions had become pretty tough. We didn’t give up though and were eventually rewarded with killer views of a Northern Beardless-Tyrannulet eating bugs and generally putting on a show. Always nice to get such great views of a relatively tough to find bird. A quick stop at the Alamo Inn allowed us to finally find a couple of Tropical Kingbirds that were kind enough to vocalize and while searching we had a fun flyover in the shape of a Long-billed Curlew. This was the first for the trip and definitely not a species I’d have expected to pick up there. After a quick stop in at the hotel to drop bags, our last stop of our day was at Oliviera Park in Brownsville. Here we sought out the spectacular roosts of feral parrots that call the valley home. Like clockwork the parrots started to arrive at dusk and we ended up tallying five species of Amazona Parrot: Red-crowned, Red-lored, White-fronted, Yellow-headed and Lilac-crowned. Though only one species is countable it was great fun dashing around the park, trying to pin all five species down while trying to communicate though the cacophony of roosting parrot hordes. An fun end to the day was capped when we picked up a Barn Owl flyby as we headed home to our hotel. Our penultimate morning started at Old Port Isabel Road. Here we were greeted by the wonderful experience of hearing both Eastern and Western Meadowlarks calling. 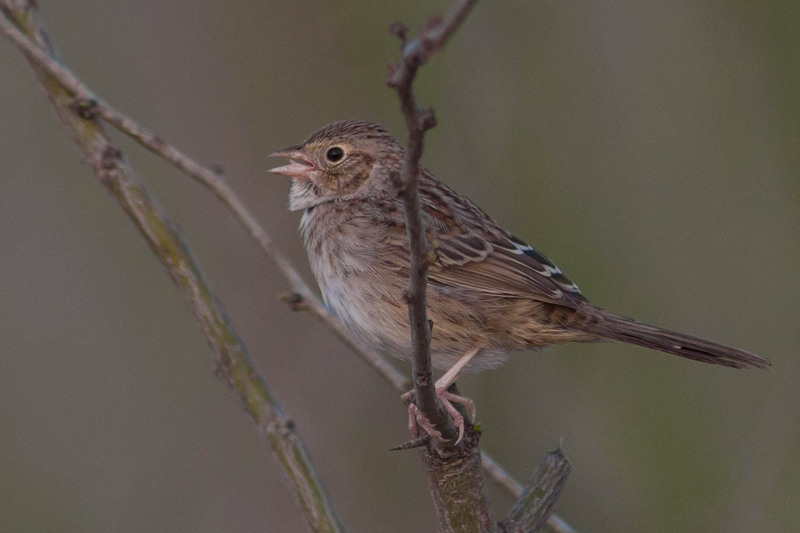 Most exciting though was a Cassin’s Sparrow popping up alongside the car and singing vociferously all of its own accord. Missing among the Long-billed Curlews, White-tailed Hawks and Peregrine Falcon however were the hoped for Aplomado Falcon’s. I quickly rethought our strategy for this species and a few miles drive later we were looking at a beautiful gracefully gray Aplomado Falcon, a pretty, elegant falcon that exists in the US almost solely in this little corner of Texas. Another highly desired prize for our growing species list. Next stop was at a windy Chachalaca Bend where howling winds conspired against us finding a regularly reported Rose-throated Becard. In fact, it was hard to see much of anything at all with the winds whipping through the trees though we each had glimpses of movement that could have been the bird. After putting in some hard work we decided to head for pastures new and stopped at South Padre Island. 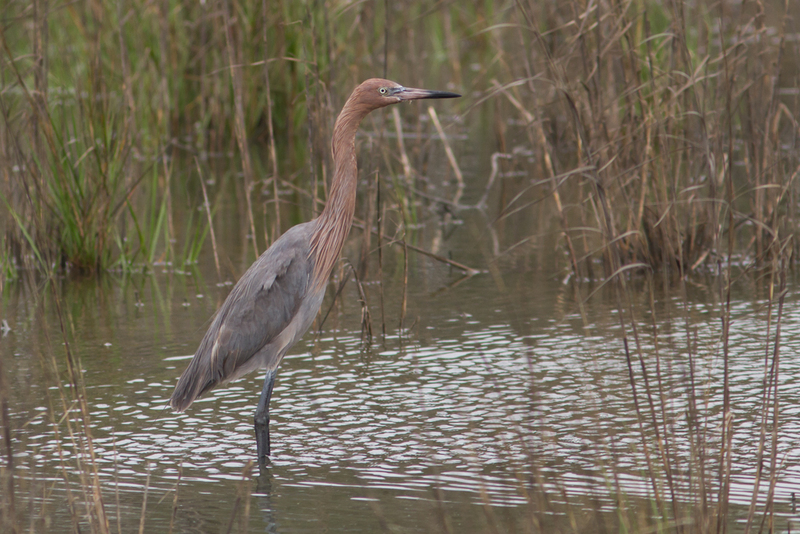 Here we enjoyed “all the herons”, or at least most of them, and a bunch of other new bird species. Driving onto the beach we managed a little shorebird workshop and picked up a couple of beautiful pink flushed Franklin’s Gulls from a collection of Laughing Gulls. Another highlight here were the large groups of Black Skimmers lounging on the beach with their inimitable bill resting loafing style. As much as it was fun to add a bunch of new birds it was good to just do some birding rather than focus on twitching something rare. We ended our mornings birding with a trip to a favored burger joint before getting on the road to head north out of the valley. After eating up some miles in order to be ready for our final day adventure, we ended our day at a comically windswept birding site in Corpus Christi before heading for our hotel in Port Aransas. 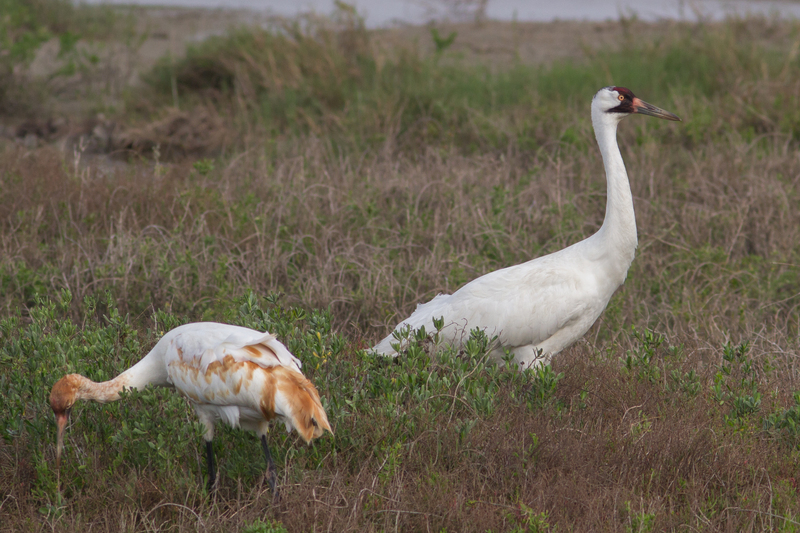 Our last real birding day started with a fun ferry ride from Port Aransas in order to connect with out boat trip out to Aransas Bay to look for one of North America’s rarest birds: Whooping Crane. These magnificent birds stand five feet tall and have an incredible seven-and-a-half-foot wingspan. In 1941 their population had plummeted precipitously to just 20 or so birds and though currently doing much better it is estimated that there are perhaps only as many as 700 in existence between both wild and captive populations. The birds that winter at Aransas are part of the only remaining migratory population, with these birds spending colder months in Texas before heading on a one-way migration that spans almost 3000 miles to Alberta. Though you can see them from land, I always think part of the magic of seeing this species is to take a boat out into Aransas Bay to see the birds. Here from miles away one can see these large and surprisingly elegant birds. It’s always a huge pleasure to see them, and this year there was an added relief to see them doing so well after Hurricane Harvey. We ended up having about as good a view as I’ve ever had of these magnificent birds and were also treated to a nice mix of shorebirds and waterfowl along the way including Common Loons. American Avocets and Hooded Mergansers along the way. A couple of quick stops on the way out of town also garnered us a few nice species. These detours included an American Oystercatcher and an accommodating Reddish Egret at Goose Island State Park as well as a small collection of Boat-tailed Grackles on State Highway 35 just north of Rockport. With our time in Texas running out we decided to roll the dice once again and head to look for the Golden-crowned Warbler en route to San Antonio. The weather now was starting to conspire against us, however, so we had to sit out a few showers eating lunch before we could bird. Again, we ended up leaving town without the bird, though there was at least more general activity this time around at the park. With light fading we made one quick last stop near san Antonio at Braunig Lake to see if we could scrape up one more life bird for almost everyone involved. Though the light was starting to go we picked up a large flock of hoped for Cave Swallows, eventually getting just about satisfactory looks at this lifer bird for many. We also managed to pick up our first Song Sparrows of the trip (one of those common US birds that is oddly missing birds from the Rio Grande Valley) and a group of dainty Bonaparte’s Gulls flying buoyantly out over the lake. We ended our day with a fun meal, a few beverages and probably about three whole days’ worth of calories just in cheesecake alone. A really enjoyable end to a fun week in Texas. In the end we tallied an impressive number of species (Texas Tour Checklist February 2018) including many of the harder to find local and winter specialties and one beautiful vagrant: Blue Bunting. Southern Texas must rate as one of the premier destinations for birdwatchers across the USA and deservedly so. I just hope that all the places that we visited along the way stay accessible to the public in future years, rather than finding themselves on the wrong side of an ill-conceived border wall. Thanks to Andrea, Linda, Janet and Nancy for a fun week. Oh, and I even got my rather scruffy Blue Jay at the Gas Station fill up on the way to the rental drop off! On my usual Sunday morning birding run with David Bell we checked out a neat area in Duarte along the San Gabriel River which I’ve found can often be good for migrants. This year thanks perhaps to some additional rain there is a veritable forest of Tree Tobacco (Nicotiana glauca) growing at the north end of the canyon. 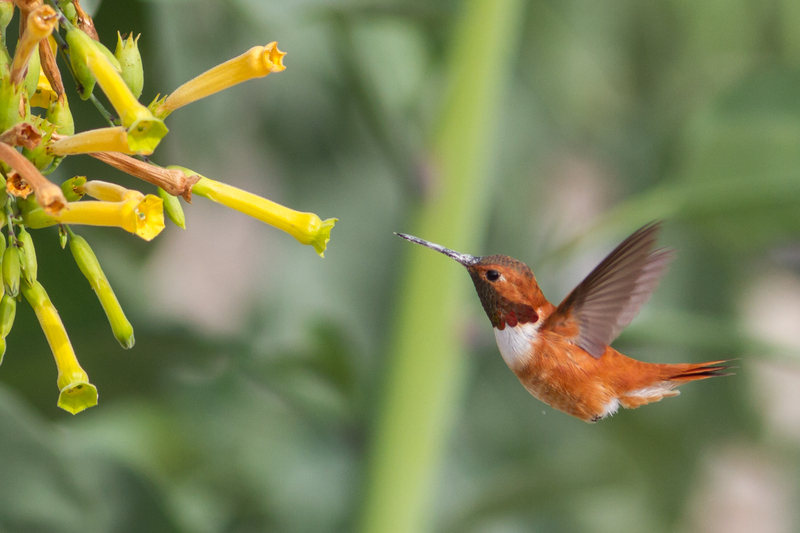 This introduced plant species always seems to be a big hit with hummingbirds and sure enough we quickly found a large number of hummingbirds taking advantage of the bumper crop of yellow flowers. 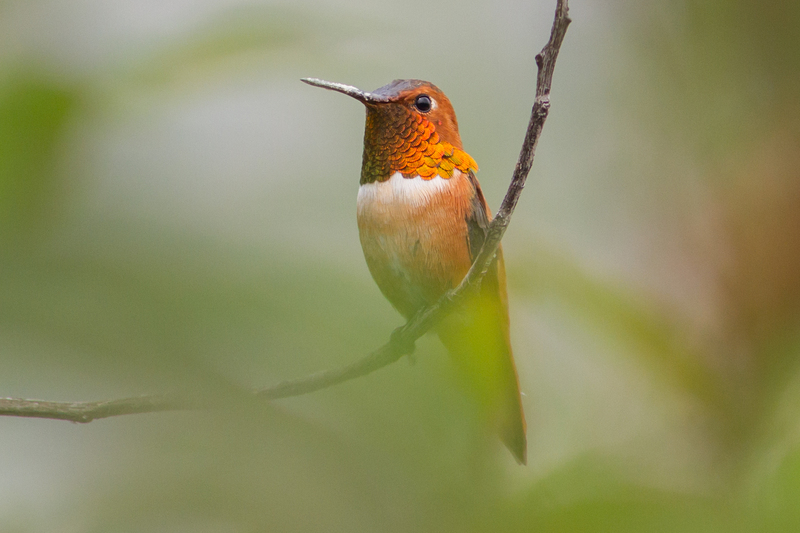 As well as the expected Allen’s and Anna’s Hummingbirds there were large concentrations of Rufous Hummingbirds and a good number of Costa’s too. 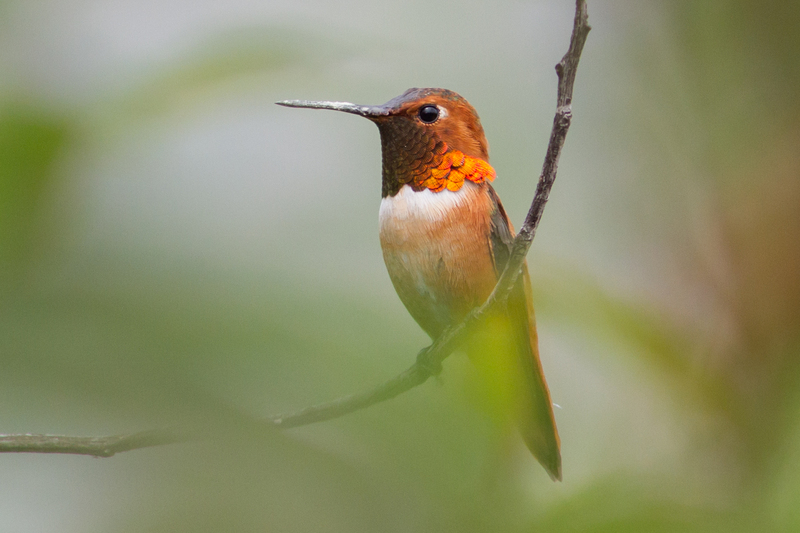 Rufous Hummingbirds are one of those fairly early migrants and in my mind are one of the real signs of spring. It’s always nice when a spot that you’ve been exploring pays off, and bumper numbers of hummingbirds are never to be sniffed at. It was also nice to see them concentrated in somewhat wild (if not totally native) habitat rather than swarming around a feeder. That said it’s easier to shoot hummingbirds at feeders than having to stalk them through the undergrowth! Win some lose some. After our first night in Albuquerque, spent at a traditional New Mexican restaurant, we started the birding element of our tour at a site just south of the Sandia Mountains. Here among in the suburbs of Albuquerque we sought out a host of Pinyon-Juniper woodland species. On site we were greeted by several frugivore species including numerous American Robins and Cedar Waxwings mainly flying high overhead. Soon though we were stumbling upon more desirable species including our first Western Bluebirds of the trip and following hot on the heels of that a small group of Mountain Bluebirds: the females providing an interesting ID challenge to discuss. Signs that local mountains harbored a poor winter food crop were evident in the numerous montane denizens down at these lower elevations. We had both Steller’s Jays along with the expected Woodhouse’s Jays and highly prized Cassin’s Finches along with the expected House Finch. Another treat at our first stop were two Sage Thrashers and we got great scope views of this very mockingbird-esque thrasher species. It was nice to be able to compare this species with the much more typically thrasher-like Curve-billed Thrasher spotted in a neighborhood yard as we headed to our next stop. Our next stop of our tour is always a highlight: Sandia Crest. Making this beautiful destination even more arresting was an overnight hoarfrost that had coated all the trees at Sandia Crest with a twinkling coating of little icy crystals. The ice, some blowing snow, blue sky and the incredible soft pinks of arriving rosy-finches making this site even more magical than usual. Among the numerous Black Rosy-Finches we slowly workshopped the identification of both Brown-capped and Gray-crowned Rosy-Finches (sometimes a harder ID than most anticipate). Just for good measure we even added at least one of the striking “Hepburn’s” Gray-crowned Rosy-Finches to our sweep of these amazing birds. As well as these incredible birds we also managed to add an unexpected subspecies of Junco (Cassiar) to our previous tally of Oregon, Pink-sided and Gray-headed. After a well-earned lunch, the rest of the day was spent out picking up more woodland species. The lack of food at higher elevations meant that birds were harder to come by than on previous years but over the rest of the day we added a mix of new birds which were highlighted by another Sage Thrasher, several neat Townsend’s Solitaires, more Cassin’s Finches and a pretty Red-naped Sapsucker. Day two started with a trip to Petroglyph National Monument. The day was off to a real bang when we spotted our third thrasher species of the trip in the shape of a subtle but stunning Crissal Thrasher! As well as the thrasher this site held a host of stunning sparrow species and we slowly worked good views of Black-throated, Sagebrush and Rufous-crowned Sparrows. Jaunty Rock and Canyon Wrens sang out from the hillsides and we also picked up a bonus flyover Prairie Falcon. All this while being surrounded by a collection of interesting and sometimes odd historical rock graffiti. On the drive out we spotted an introduced, but no less beautiful for that, Ring-necked Pheasant. Hot on the heels of the pheasant was a brief pause for a tick-and-run American Dipper that was out of place on a suburban drainage ditch. This charismatic species put on quite the show for us as it hunted prey items under water as we watched: a highly successful twitch. Next stop was our first of many along the Rio Grande. Here along the river we found ponds with a mix of new duck species including many stunning Wood Ducks. As well as entertaining us, the collected ducks had predators interested too, including a Bald Eagle that was lazily soaring up river looking for an easy meal. The riparian area also attracted a nice mix of land birds, which allowed us to study both Yellow-rumped Warbler subspecies as well as add our first Bewick’s Wren to the trip list. After a somewhat quiet visit to Water Canyon, we ended our day at the ponds just north of Bosque Del Apache. 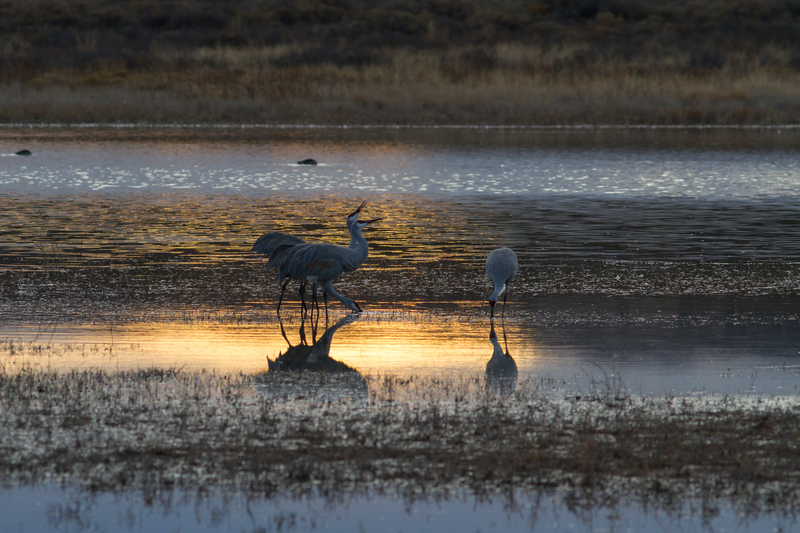 Here we arrived just in time to witness the arrival of numbers of both Lesser and Greater Sandhill Cranes. We also arrived just in time to witness an incredibly spectacular and dramatic sunset. As the sun set the sky lit up with flaming reds and yellows and bruised purples. A simply stunning setting for an end to a fun day. We kicked off our third day about twelve hours later at the exact spot we ended day two; Bosque Del Apache. The very same ponds from yesterday were now covered with thousands of mainly Snow Geese but with many pockets of Ross’s Geese too. There were also plenty of attractive ‘Blue Geese” to enjoy as well. Once considered a separate species, these “Blue Geese” are now recognized as just a color morph of Snow Goose. We finally dragged ourselves away from the goose and crane show to check out the feeders at Bosque’s wonderful visitors center. From our warm perch inside the center we watched the crowds of White-crowned Sparrows under the feeders, picking out other species from the flocks. Highlights here included a Green-tailed Towhee, a pair of splendid Pyrrhuloxias and a couple of cryptic White-throated Sparrows teased out from the swarms of their White-crowned brethren. A quick spin around Bosque heralded impressive numbers of Sandhill Cranes, geese and ducks. Among the hordes of waterfowl, we also found a few other interesting species ranging from the large (Wild Turkeys) to the tiny (Pine Siskins). We also completed our bluebird sweep when we added a half dozen Eastern Bluebirds to our expanding trip species list. Our next stop on the day was a popular park along the Rio Grande River. Here at this river migrant trap we sought out winter songbirds. 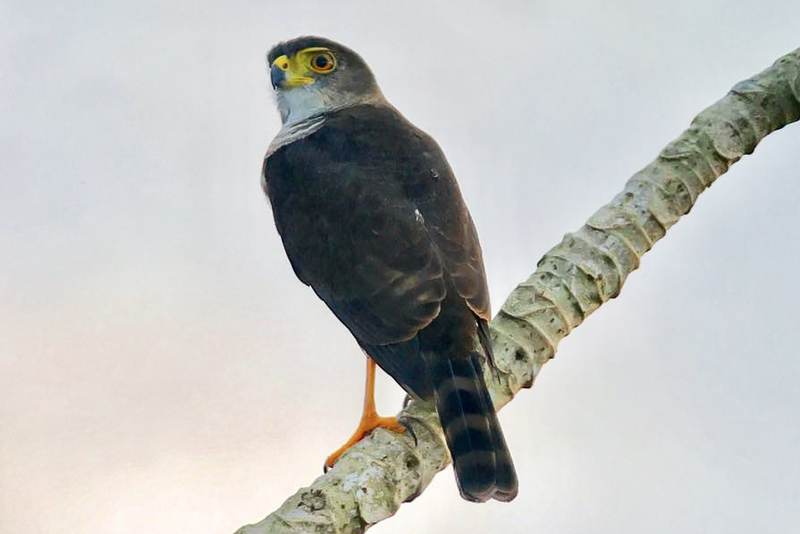 Highlights included a couple of locally breeding specialties: Verdin and Phainopepla however the star of the show was almost certainly a majestic Prairie Falcon that put on a show as it soared over our heads. We ended our day in Las Cruces seeking out sparrows at one of my favorite birding sites in the picturesque Organ Mountains. Though initially passerines were keeping their heads down thanks to the attentions of a young Cooper’s Hawk, we eventually managed to run into a nice mixed flock of wintering sparrows. As well as the sparrows we enjoyed great views of Verdin and a pair of Ruby-crowned Kinglets that were busy chasing each other and furiously flashing their crimson headdresses. 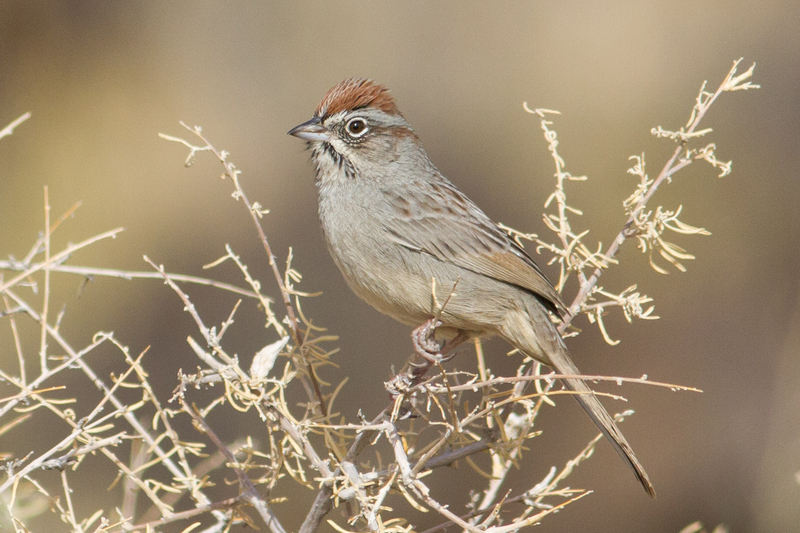 Investigating a large and varied flock of sparrows we uncovered a great mix of stunning sparrows including Green-tailed Towhee, Rufous-crowned Sparrow and Black-throated Sparrow. New for the trip though were two spiffy Black-chinned sparrows, these great sparrows look like weird hybrids between Dark-eyed Juncos and Chipping Sparrows. After teasing out our prized Black-chinned Sparrows we moved to some slightly more open habitat where we picked up another group of wintering sparrows. Pick of the bunch here were a roving flock of Brewer’s Sparrow, though just working through the identity of the various species: Savannah, Vesper, Brewer’s was part of the fun too. As were a couple of jolly Cactus Wrens that were singing away and coming to a water bowl placed out for a camper’s dog. We ended our day winging eastwards setting ourselves up for an adventure in deepest Southwestern New Mexico. Dawn on day four found us cruising along the quiet roadways of Southwestern New Mexico. Here among the gobs of Red-tailed Hawks we uncovered two beautiful Ferruginous Hawks. As well as the spectacular buteos we also added another Prairie Falcon and our first confirmed Chihuahuan Raven’s complete with observed white base to feathers and more crow like call. We also got to hear some Eastern Meadowlarks for the first time on the tour too. The renowned Willow Tank was quiet on the day, though the surrounding scrub provided thrasher species number four for the trip: Bendire’s Thrasher. We even had views of the bird in close proximity to a Curve-billed Thrasher, allowing for a robust comparison of the two very similar species. We then headed into Portal to check out some feeder action. At Dave Jasper’s the quick of binocular spotted some Scaled Quail as they disappeared into the brush. 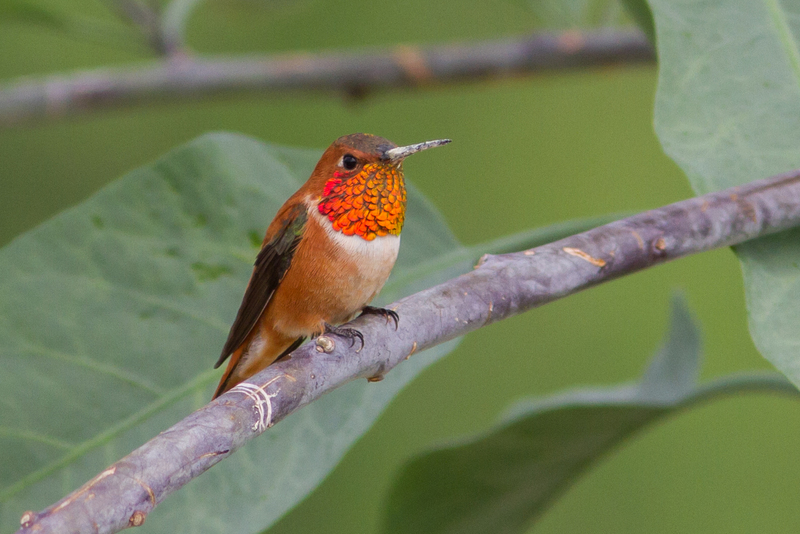 We also added our first hummingbird’s of the tour including the big, beautiful and recently split Rivoli’s Hummingbird (until recently know as Magnificent) and a couple of Anna’s Hummingbirds. Next on the itinerary was a favorite stop of the tour: Cave Creek Ranch. This incredible site is seemingly always dripping with birds, including a host of new ones for the trip list: Inca Dove, Blue-throated Hummingbird, Arizona Woodpecker, Mexican Jay, Bridled Titmouse, Yellow-eyed Junco and Scott’s Oriole. The carefree titmice were a huge hit as were the woodpecker and the scary-eyed junco. Highlight of the stop though was perhaps the out of season Scott’s Oriole – a real desert beauty. Post lunch we added our first Brown-headed Cowbirds for the trip, loitering ominously around town and had further good looks at Greater Roadrunner. Our day ended in wonderful Willcox. A seemingly inauspicious golf course provided for a wealth of brilliant birds: In amongst the blackbirds coming to roost were a small flock of lovely Yellow-headed Blackbirds, the flocks of American Wigeon yielded one rare Eurasian Wigeon among them and flying over were a rare group of twenty Greater White-fronted Geese. One of the real highlights of the spot though had to be the calling Long-billed Curlews that flew in to at dusk. All this accompanied by the constant calls of multiple Sandhill Cranes as they headed to roost. Again, we started our day as we ended our previous one, on a golf course in Willcox. The site yielded little different than the night before, beyond some beautiful but untickable Peafowl, though a lone Gambel’s Quail did increase our tour species list by one. Driving local agricultural fields yielded several common open country species, but no views of the rarer ones we had hoped for. That said a brief stop to enjoy some more Yellow-headed Blackbirds uncovered a roosting Great Horned Owl and a stunning Vermilion Flycatcher. After a brief stop at a quirky small-town coffee bar for an invigorating cup of joe and some homemade cookie,s we were back on the road looking for more birds. A quick stop at a waste water treatment plant (a mainstay of any arid region birding) yielded some beautiful Cinnamon Teal and our first Eared Grebe of the tour. Our next stop was another water treatment plant which provided more productive for passerines around the edge of the ponds, as we picked off both Black-tailed Gnatcatcher and the highly localized Rufous-winged Sparrow. We ended our day looking for, but not finding, a couple of rare Mexican vagrants in Tubac though we did at least manage to get everyone looks at both Green-tailed and Abert’s Towhees. We started our day in the beautiful surroundings of the Las Cienegas. Here we were seeking out perhaps one of North America’s most sought after and hard to find sparrow species: Baird’s Sparrow. 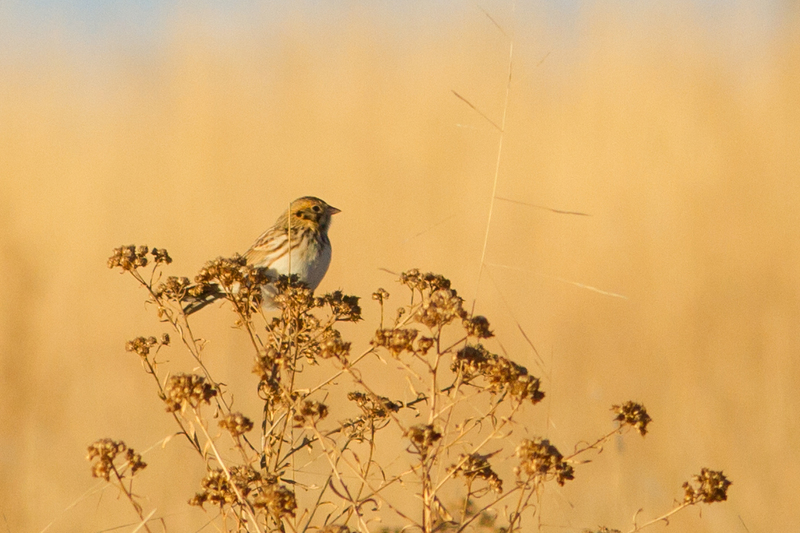 Surrounded by stunning mountain vistas amid a golden expanse of grassland we waited patiently for the birds to appear. Initial views were fleeting at best however and we eventually turned to a more proactive approach to finding the birds as the morning wore on. This manhunt approach, proved successful, eventually garnering amazing scoped views of this stunning sparrow species. 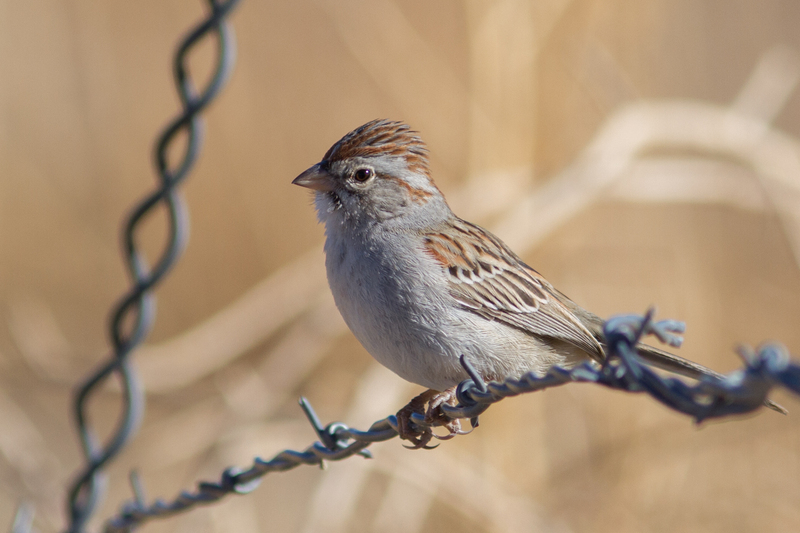 In the fields around us flocks of Chestnut-collared Longspurs wheeled away and a cute little Grasshopper Sparrow popped up to try steal some of the Baird’s limelight. The next field on our tour yielded a puddle of dirty water, a bunch of cowpats and more excitingly a group of beautiful Pronghorn. Targets here were the mixed flocks of larks, pipits and longspurs coming in to feed and drink at the pool. Though birds were swirling around and disappearing behind the cowpats as they landed we were soon able to uncover both Chestnut-collared and McCown’s Longspurs and some of the group were able to briefly get on the ‘rarer’ Lapland Longspur (though rare in AZ, it the world’s most abundant longspur species). As we got back on the road again, an eagle-eyed participant pulled out a pair of White-tailed Kites from amid the heat haze of a nearby field. A stop at the renowned Paton’s Hummingbird Feeders provided at least one beautiful Anna’s Hummingbird which put on a real show for the group. As well as the expected Red-naped Sapsucker we also had what is being identified as a Red-breasted Sapsucker, though to my eye it looks more like a hybrid. Most of our afternoon was spent back at Santa Gertrudis Lane. Though there was a lot of birds to look through (unlike the previous day) we still didn’t add any of the Mexican vagrants to our list. We did however uncover a bunch of new and somewhat uncommon species to our list including Wilson’s Snipe, Plumbeous Vireo, Black-and-White Warbler and Pacific-slope Flycatcher. We ended our tour with a quick stop at our final wastewater treatment plant of the trip. Here we added a rare, but long staying, Brown Pelican as well as a bunch of egrets and herons and a southern specialty in the shape of a Bronzed Cowbird. In the end we had a great trip with incredible scenery, beautiful birds and a variety of amazing birding spectacle. 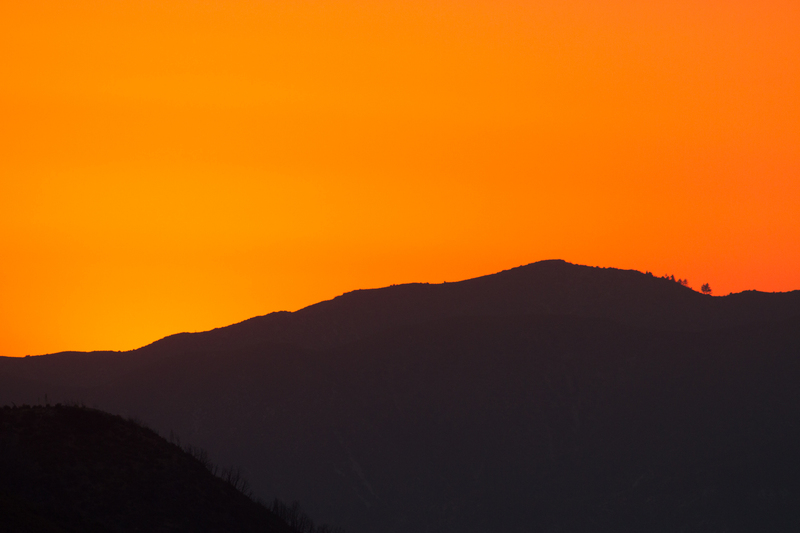 Highlights included ice dusted mountains, golden grasslands and spectacular fiery-skied sunsets. 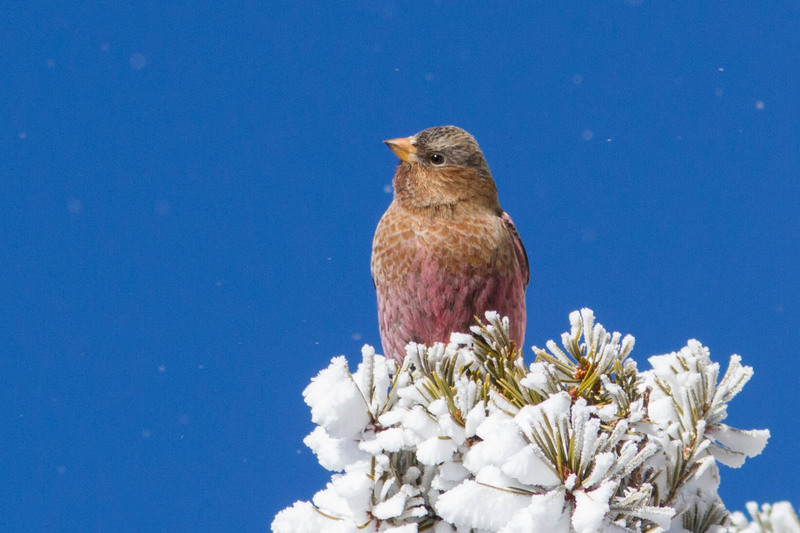 We had stunning Rosy-finches that rarely stray from their mountaintop homes and clouds of incredible geese at Bosque. A wonderful week with an equally wonderful and interesting group of birders from across the US. You can see our species checklist from the week here: Southwest Tour Checklist. Panama, not just a terrible Van Halen track! In November 2014 I had seen reports of a flight of raptors that had blackened skies around Panama City and closed the airport there for a couple of days. In total the flight had been calculated to include an incredible two million birds, all seen from the Cerro Ancon Hawkwatch in downtown. From there the seed of this tour with HMANA had been planted. With some help from Jenn, Carlos, Elba and the crew at Canopy Family that dream became a reality three years later. With nature and hawkwatching there are no guarantees, but we had put ourselves in the time frame for a potentially interesting trip and with Carlos Bethancourt as our guide I was confident we would have a great week whatever happened. Our tour started Saturday morning with transfers from the airport, via a couple of hotels, to Canopy Tower. As you make your way through downtown Panama it’s hard to miss the three large and ubiquitous black birds circling constantly over the city: Black Vulture, Turkey Vulture and most excitingly Magnificent Frigatebird! There were a few other interesting birds as we wended our way through city streets including drive by glimpses of Fork-tailed Flycatcher and Wood Stork. A little over an hour later we arrived at the world-famous Canopy Tower. It’s a fantastic one-of-a-kind lodge converted from an old US military radar installation. We arrived to a warm welcome from Carlos Bethancourt (our trusty guide for the week) and a selection of drinks and snacks. 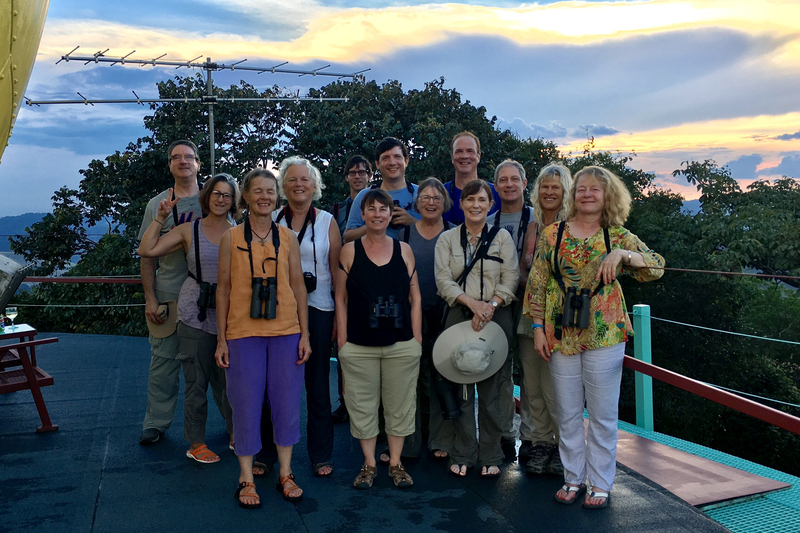 With some of the group arriving a little later in the day, the initial arrivals had a chance to grab some coffee and head to the lodge roof, home of Semaphore Hill Hawkwatch, for the first of many enjoyable hours spent observing birds above the canopy of Soberania National Park. 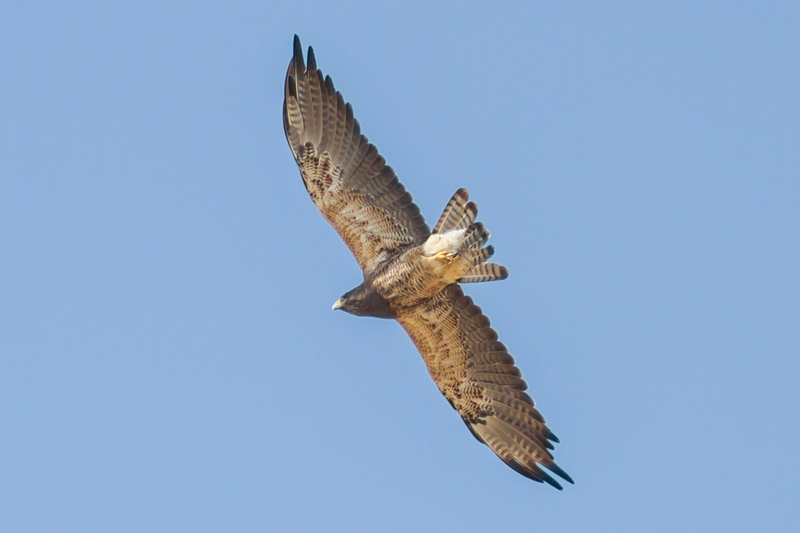 It didn’t take long before we were picking up our first interesting raptors of the tour in the shape of hunting Short-tailed and Zone-tailed Hawks. Though only found on the extreme edges of the USA, both of these species are at least possible to encounter in the US. There were a couple of non-raptor species around the tower that were more or less familiar to many of our group too including Red-eyed Vireo, Swainson’s Thrush, Tennessee Warbler and Eastern Wood-Pewee. It was however a novel experience to have Bay-breasted Warbler as the somewhat ever-present warbler species of the trip, dare one call something so pretty a trash bird even jokingly? The remainder of the group arrived late afternoon from the airport and post introductions we headed out to the rooftop platform to enjoy the last few hours of sunlight. 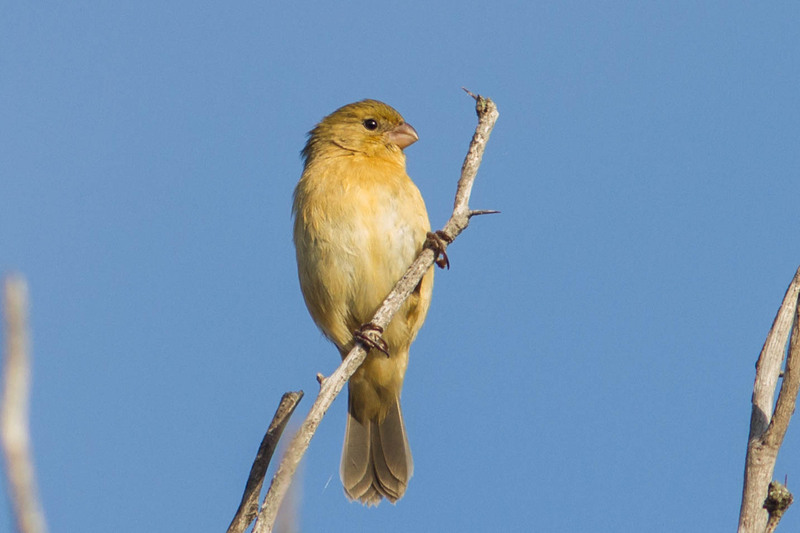 As well as the avian migrants from points north, the wandering flocks of wintering birds also contained many local delights, which included both the ever-present Palm and Plain-colored Tanagers as well as species that merely flitted in and out of our presence at the tower. These roving bird flocks comprised of both the cryptic: Plain Xenops, Olivaceous and Cocoa Woodcreeper as well as the dazzling: Bay-headed Tanager, Blue Dacnis and Green Honeycreeper! A wonderful evening meal, a couple of bottles of wine and a bottle of Tequila brought in from Mexico by a participant helped cap a nice relaxing introductory day to the Canopy Tower. This morning we awoke to the usual reveille at the Canopy Tower: Mantled Howler Monkey and Great Tinamou. As the sun climbed above the local hills our group could be found drinking in both coffee and the sights and sounds of the forest surrounding us. As the trees lit up around us, so more species from home would appear: Summer Tanager, Chimney Swift and Blackburnian Warbler as would more exotic ones too like Mealy Parrot, Tropical Gnatcatcher and Black-breasted Puffbird. As the day heated up we picked up our first migrating raptors of the trip, after zero movement the day before thanks to some blocking weather on the Costa Rican border. The inclement weather in Costa Rica seemed to have delayed much of the flight through Panama and so among the expected Turkey Vultures and Swainson’s Hawks were proportionally significant groups of Broad-winged Hawks, with even a few adults still in the mix. After breakfast we ventured from our canopy perch down to the base of the lodge tower where we picked up the resident hummingbird species attending their feeders: White-vented Plumeleteer, Blue-chested Hummingbird, White-necked Jacobin and a rather stunning Long-billed Hermit. A hike down the road that leads to the lodge to the main road revealed many new species for the trip including some real crowd pleasers like White-whiskered Puffbird, Red-capped Manakin and Fasciated Antshrike. Before our return for lunch we also added another adorable hummingbird species to our day’s tally: Violet-bellied. Post lunch we headed for Panama Viejo, which at first appears to be just a somewhat inauspicious parking lot over an expanse of mudflats. The mudflats however are alive with a wealth of shorebirds including the familiar: Western Sandpipers and the less familiar: Southern Lapwings. There was much else to enjoy too including stunning Cocoi Herons out on the flats and around us in the trees more avian treasures including Sapphire-throated Hummingbird, Saffron Finch and “Mangrove” Yellow Warblers. 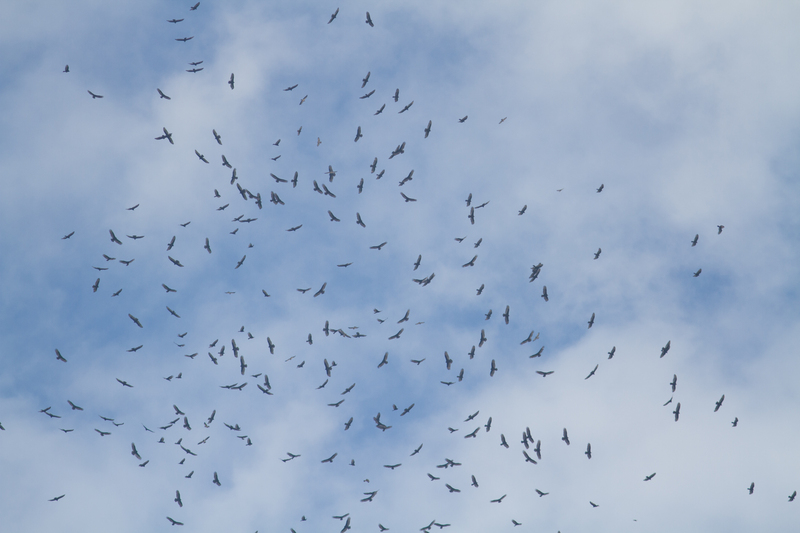 There were also some signs of raptor movement overhead, mainly in the form of large kettles of Turkey Vultures streaming eastwards in the thousands. With the Turkey Vultures we picked up a couple of other migrants including a late juvenile Mississippi Kite and a couple of Peregrine Falcons. 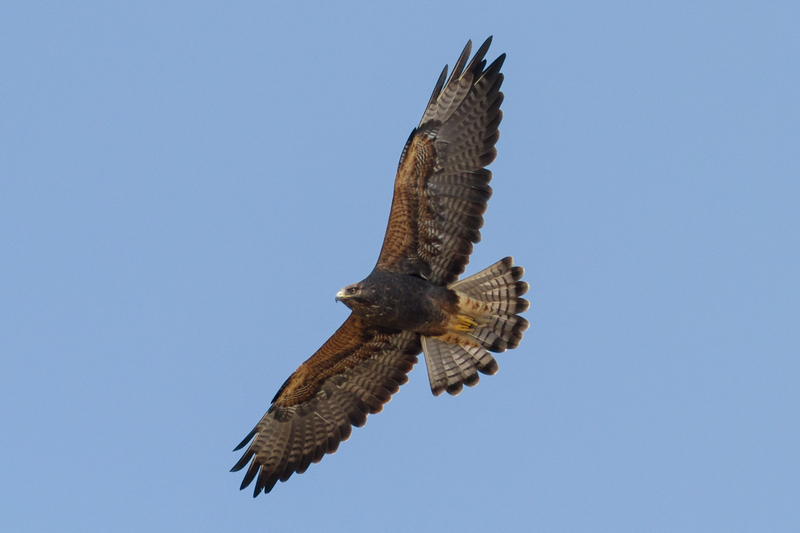 Though not migrating, a beautiful Common Black Hawk put in a quick appearance too. This stop at Panama Viejo must rate among one of my favorite parking lot birding experiences of all time. As well as the birds it was also fun to share our birdwatching experience with the Panamanians visiting the museum and cultural center dedicated to the history of the area. Panama Viejo is the site of the oldest European settlement on the Pacific coast of the Americas and is a UNESCO World Heritage Site. Our day started with a Mottled Owl alarm call and coffee on the tower viewing platform. Post breakfast we headed for the world-famous Pipeline Road. This road and the pipeline it was built to provide access to were constructed during World War II but the pipeline never actually went into service. Now it is perhaps one of the premier birding areas in both Panama and the region generally. First stop was at the Ammo Dump Ponds, a place where explosives were stored by the US Army and that is now an area used to store explosives for construction by the Panama Canal Authority. The little ponds there can be excellent for water loving species and we soon had a host of them including beautiful Rufescent Tiger-Herons (named for the cryptic plumage of the juvenile), Wattled Jacanas and Purple Gallinules. We could hear the rolling rattle calls of White-throated Crake too, but none appeared to particularly want to be seen. 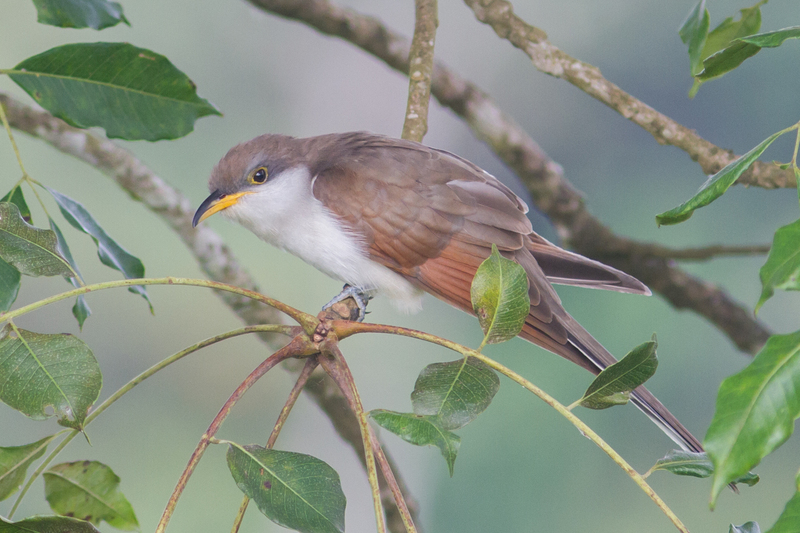 In the trees and brush around the pond there were plenty of other birds to enjoy including an incredibly showy Yellow-billed Cuckoo. Along with Black-striped Sparrow and Variable Seedeater, another show stopper at the ponds was a singing Isthmian Wren. This somewhat localized and recently split wren species performed well for the group as we uncovered more and more new trip birds. Behind us flowed the river chagres and coursing over it were a steady stream of swallows, including Southern Rough-winged Swallow, Mangrove Swallow and the ubiquitous Gray-breasted Martins. 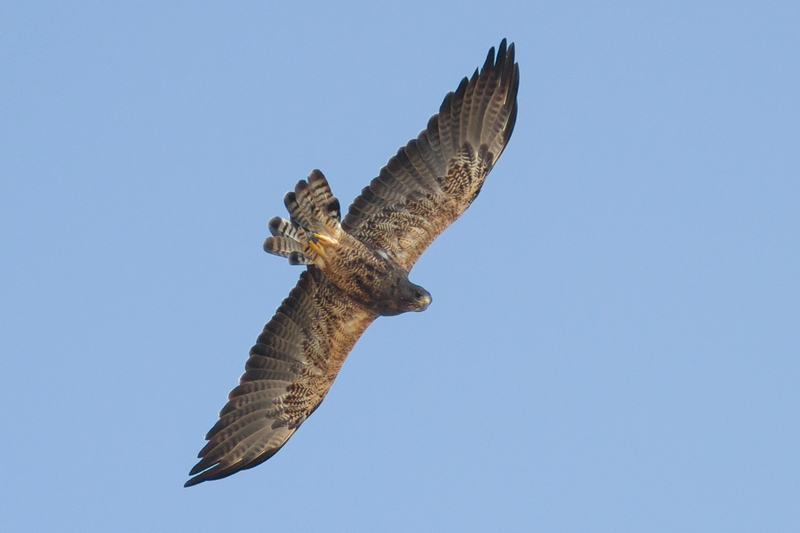 Joining the hirundines in the sky were a couple of highly desired raptors: White Hawk and Snail Kite. These two beauties were morning highlights for our raptor aficionado group. We had barely arrived at Pipeline Road proper, when Carlos heard the mournful call of a Streak-chested Antpitta. Springing into action, our tour group all worked well together to make sure that all got great looks at this skulky and highly prized denizen of the forest floor. While we were patiently trying to eke out looks at this cryptic bird we also managed to get good looks at an easy to hear but difficult to see Great Tinamou, as one seemingly wandered in to see what all the excitement was about. A furtive forest dwelling twofer right at the entrance of Pipeline Road! We had hardly made it around the first bend in the road before a mixed flock of species descended upon us. As birds swarm around you it’s sometimes hard to keep up with the action, as different birds appear within the melee. Again, our group worked hard to get everyone on the different birds as they flitted past us. 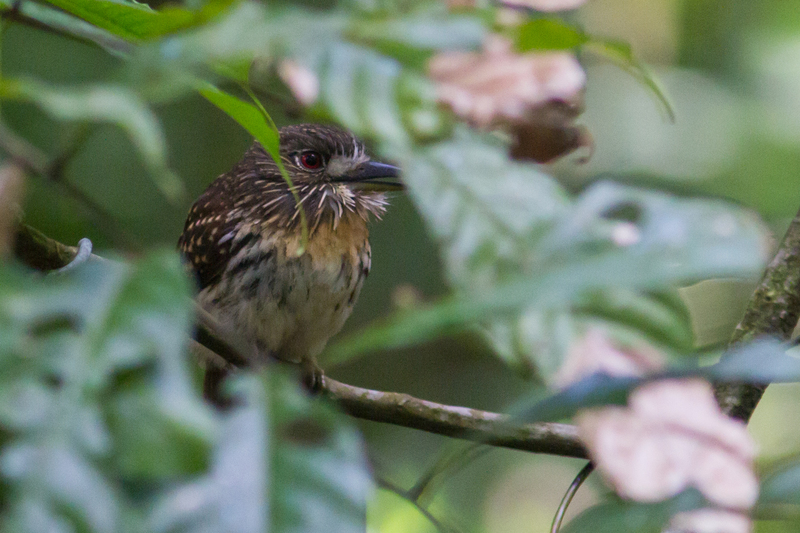 Antbirds are something of the draw on Pipeline and a bunch of them were passing through our patch of forest: Fasciated Antshrike, Black-crowned Antshrike and a personal favorite Dot-winged Antwren. For every enigmatic antbird, there was a much showier denizen of the forest appearing including Slaty-tailed, Black-tailed and the recently renamed Gartered Trogon. In the end we had walked less than a few hundred yards down the Pipeline Road, so thick was it with birds. We ended our morning visit with an audience with a Great Potoo, perhaps the most cryptic resident of the local forest, found perched in a somewhat favored spot. All this and it was only just time for lunch! After a hearty lunch we headed up to the platform at the Canopy Tower where we joined Semaphore Hill hawk counter Katrina Hucks for an outstanding little rush of hawk migration ahead of a storm front. Initially we had spotted a few very distant kettles of pepperspots, but within a few minutes we found ourselves being inundated by Turkey Vultures and Swainson’s Hawks as roughly 30,000 drifted northeastwards away from Panama City and over our platform aerie (Hawkcount data here). Among this rush of migrating birds, we picked out a few other desired raptors including a beautiful adult King Vulture and a Semiplumbeous Hawk that was perched atop a tree in the canopy out front of the platform. Having counted relatively large movements of raptors before it was amazing to be overwhelmed by such a compressed mass movement of birds riding ahead of the day’s rain. We ended our day with another wonderful meal at the Canopy Tower which was accompanied by a spectacular Black-and-White Owl perched out in the forest surrounding the dining room. A magnificent end to another incredible day. With the previous day’s flight of raptors in our mind Carlos and I decided that our plan for the day should revolve around Panama City and our eyes should always be partly watching the skies for raptor movement. After battling a little Panama City traffic, we started our morning at the Parque Natural Metropolitano near downtown. Here one can find a wealth of dry or pacific slope species including such prized birds as Golden-collared and Lance-tailed Manakin. Again, it didn’t take long to get into a mixed flock of birds and among the species revealed we found everything from the relatively prosaic: Northern Waterthrush and Chestnut-sided Warbler to the highly desired: Rufous-breasted Wren, Red-throated Ant-tanager and Panama Flycatcher. More exploring along the park’s trails also uncovered Red-crowned Ant-tanager and Orange-billed Sparrow. Highlights of our stop also had to include Whooping Motmot, our first Bat Falcon and a mammal in the shape of an adorable Rothschild’s Porcupine! As we birded, I could tell Carlos’s raptor Spidey-sense was tingling as strongly as mine and we decided to head to look at what was happening with the hawk migration. As soon as we reached some open skies it was obvious what was happening; things were going bananas! Leaving the park, we paused briefly along the roadside at the Marcos A. Gelabert Airport to watch a growing liftoff of vultures that were surely grounded by yesterday’s afternoon rain. From there Carlos steered our bus towards a downtown city park from which to watch the ever-growing kettles and streams of passing raptors. We arrived at Cinta Costera park just in time for the skies to be filled with raptors, and over the next couple of hours watched as Panama City tallied its second highest single day number of migrant Turkey Vultures of all time: 715,517 in total! Perusing Hawkcount when we got home, this was the just the third largest Turkey Vulture day ever recorded at any hawkwatch anywhere in the world! Hawk people talk reverentially of million bird hawkwatches and yet we had almost just seen that number in one single day! As the skies filled with raptors, our minds were filled with conquistador descriptions of skies being blackened by birds as they surely witnessed this very same migration hundreds of years prior. Though the flight was somewhat homogenous we reveled in the sheer mind-blowing spectacle. 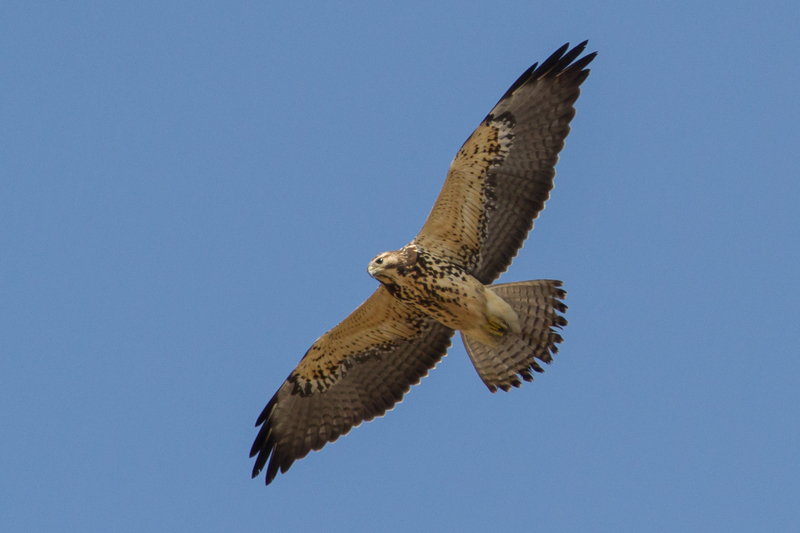 In among the huge numbers of Swainson’s Hawks (134,260) there were good numbers of Broad-winged Hawks (27,646) and a smattering of other species: Mississipi Kites, Peregrines, Ospreys and Wood Storks. Even the seemingly unpromising downtown park around us was providing a bounty of nice birds including a handful seen only here on our trip: Boat-billed Flycatcher, Gray Kingbird and most excitingly, out on the bay, a gorgeous Blue-footed Booby or two! We spent the next three hours reveling in this incredible spectacle while sharing our experience with park visitors: Panamanians and tourists alike. We even had a brief interview with journalists from a local blog that highlights things to do in Panama. The best part of the morning though was having Rosabel Miro from Panama Audubon join us for an hour or so to meet the group and talk about Cerro Ancon Hawkwatch. Though hard to tear ourselves away, we headed for lunch downtown before heading off to the Quarry Heights area to enjoy the continuation of the flight. We finally left the continuing stream of birds in order to avoid getting stuck in the post work rush hour traffic. An incredible day that I’m sure will live long in the memories of those that witnessed it! There is some great video of the incredible day shot by one of the participants on youtube (here) and details of course on Hawkcount here! Our fifth day in Panama started with a bang, when pre-breakfast atop the tower we found ourselves face to face with a stunning Tiny Hawk! It seems like Carlos and I have incredible luck together when it comes to discovering difficult to find accipiters (last time we were together we found a very accommodating juvenile Bicolored Hawk) and I was amazed to find myself staring at this remarkable little raptor as it flew in to join us for morning coffee! It stuck around long enough for most of the group to rush upstairs to see it before disappearing off into the park below. A great start to the day! Post breakfast we found ourselves hotfooting it from the hummingbird feeders at the Panama Rainforest Discovery Center (where we had picked up Crowned Woodnymph and for a lucky few Purple-crowned Fairy) out to the entrance of the center. Here we found ant swarm that one of Carlos’s fellow guides had called us about. We spent the next hour or so watching as antbirds and more came in to pick off insects escaping the marauding army ants. Highlights around the swarm including amazingly accommodating Spotted and Bicolored Antbird, Northern Barred-Woodcreeper and a small flock of Gray-headed Tanagers. Earlier in the morning Carlos had managed to tease both Song Wren and Black-faced Antthrush into view for us. Both are charismatic birds, with one mainly memorable for the way it struts around the forest floor, the other for it’s amazing refrain! Morning had also seen us add trogon number four to our trip list: a stunning male Black-throated Trogon. Before we left the Rainforest Discovery Center, we had just enough time to do a little shopping, have Carlos present the Discovery Center with a donated spotting scope and even pick up another great raptor for the tour: Hook-billed Kite. A wonderful action-packed morning of birds. After lunch we finally had some rain catch up with us. It was green season, so I had anticipated getting a bit wet at least once on the tour. We’d had a fairly successful stop at Summit Ponds with both Boat-billed Heron and American Pygmy Kingfisher in the bag when Carlos, spotting the enveloping clouds, decided we needed to head for shelter. Unfortunately, our ride to the ponds was in an open top bus and as we hit the road homeward bound the heavens opened. Thus ensued a hilariously rain lashed ride back to the Canopy Tower with much laughter and “gallows” humor from everyone involved. A little rain wasn’t going to get this great group down! We ended our day, with the expert help of one of our participants and a black light, exploring some of the remarkable moths and other nocturnal creatures that call Soberania National Park home (link to amazing moth photos here). An enjoyable end to another great day in Panama. This day saw us heading out early to visit the highlands of Cerro Azul. As we meandered across Panama City, we finally managed to knock House Sparrow off our Panama needs list. A huge relief to everyone involved I’m sure. 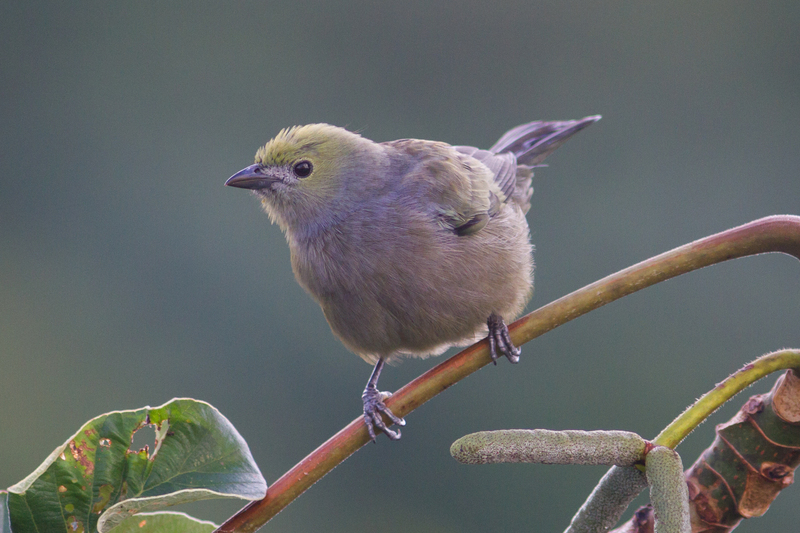 The Cerro Azul Visitors Center provided for a welcome restroom and coffee break, but also saw us picking up some good birds in the nearby gardens including a bevy of beautiful tanagers: Golden-headed, Crimson-backed and Bay-headed. Our morning birding basically involved short drives and stops at areas where birds appeared or looked productive for specific species. 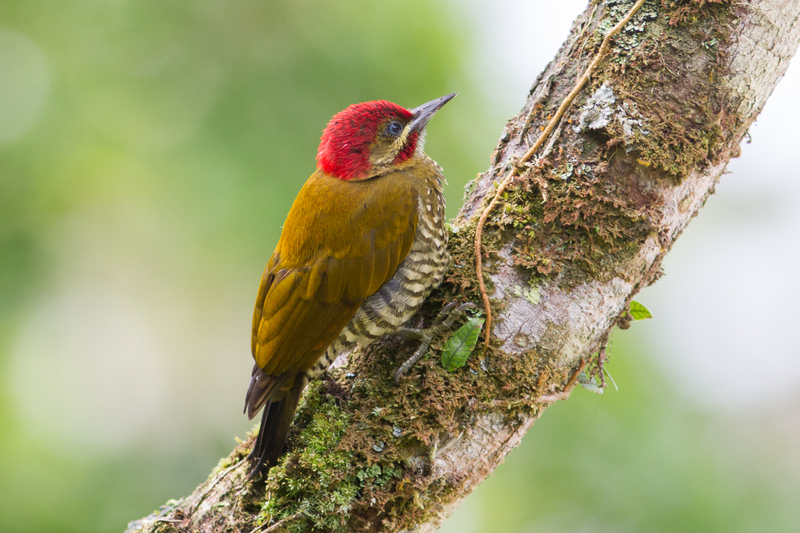 First up was an appointment with a highly prized Panamanian endemic: Stripe-cheeked Woodpecker. We were trying to work looks at one when a Merlin suddenly came careening through our patch of woods thoroughly spooking this beautiful green woodpecker. As if to compound matters a relatively rare Sharp-shinned Hawk circled the area putting everything else to flight. When we finally re-found the woodpecker, we were treated to an incredibly accommodating views of a male bird right at head height. An unusual but very welcomed situation! Other opportune stops saw us adding more new species including Streaked Saltator, Yellow-faced Grassquit and a much puzzled over Acadian Flycatcher. It was really fun to work through the identity of this silent little empidonax flycatcher on its winter grounds. After a little more stop-start driving, we reached an area where we parked in order to go on a little hike. As per usual though our hiking was abruptly halted by a mixed tanager flock. 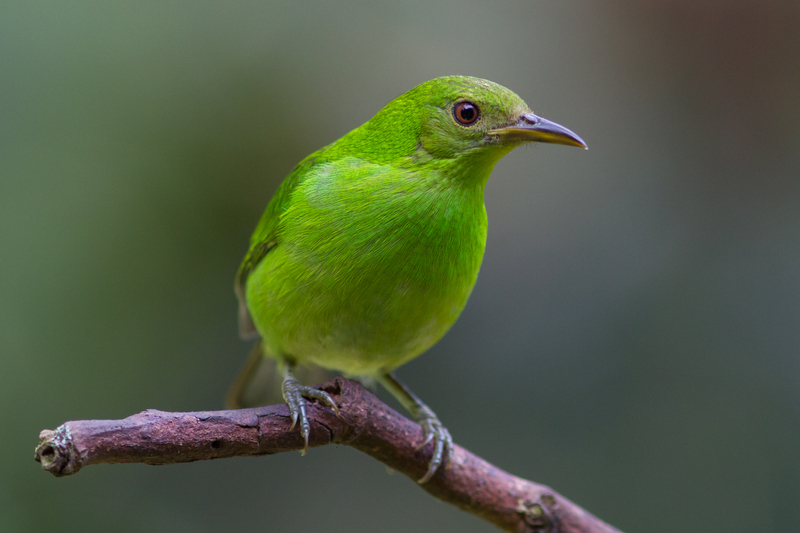 Here we uncovered a different selection of tropical jewels including Speckled, Black-and-yellow and Emerald Tanagers. 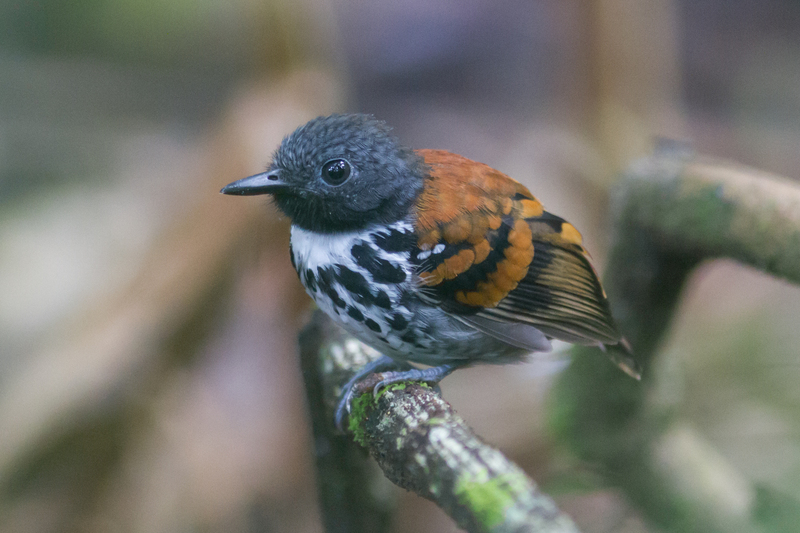 Highlight personally though was the spiffy looking and obliging Scale-crested Pygmy-Tyrant that posed for our photos. Next stop was the appropriately named Hummingbird House. Here a varied arrangement of feeders played host to not only hundreds of hummingbirds, but a wide variety of nectar, rice and fruit eating species. These included many stunning birds that comprised three types of Honeycreeper: Shining, Red-legged and Green. Also chowing down were Thick-billed Euphonia, Hepatic Tanager and a lonely Bananaquit. The hummingbirds were however certainly stars of the show. 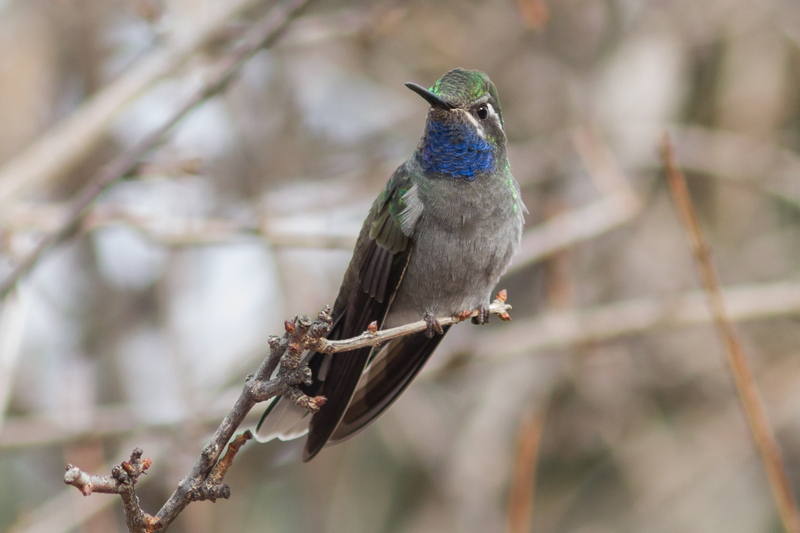 They included: Bronze-tailed Plumeleteer – a beautiful large hummingbird with bubblegum pink feet, Green Hermit another giant hummingbird with an amazing scimitar like bill, and perhaps most excitingly the near endemic Violet-capped Hummingbird. This array of birds was all enjoyed while devouring a delicious lunch on the porch of our generous hosts. After the incredible hummingbird experience, we had just a little more time to enjoy a couple more roving flocks and a riverside stop to pick up a couple of Black Phoebes. We also enjoyed watching a few passing raptors soar overhead before setting off for home. A wonderful end to a productive day in the highlands. Sadly our last full day together! As we gathered to head out for one last adventure on the Pipeline Road we were visited in the Canopy Tower parking lot by a couple of beautiful birds: precisely two Cinnamon Woodpeckers and one Green Shrike Vireo. A very nice start to the day’s proceedings. After a quick stop along the route for a perched raptor, which turned out to be an adult Broad-winged Hawk, we arrived at Pipeline Road. This time we drove in a little way enjoying birds along the road, including nice looks at both Rufous and Whooping Motmots. The open top vehicle proving perfect for laid-back lazy birding. We finally reached an area where we needed to walk to get any further. As we parked, we picked up the sounds of raucous Black-chested Jays. I wondered aloud whether they were mobbing something or simply jays being jays. With Carlos working the group closer to them we soon had our answer: they were mobbing. Target of the aforementioned mobbing was a stunning juvenile Collared Forest Falcon. Incredibly this had been top of at least one participants wish/hit list for our last day together. Again, in a difficult situation, our trusty group of leaders and participants worked diligently to get everyone on the bird. Though the falcon was moving around constantly, trying to avoid the pursuing corvid harassment squad, and even though we were momentarily distracted by a cool frog everyone finally got to see this secretive forest raptor. Next on the day’s wish list was White-tailed Trogon. Without much ado, Carlos uncovered one for us: trogon number five for the tour. As we walked the Pipeline Road trail we ran into other desirable new species including a roving flock of Purple-throated Fruitcrows, a couple of tiny and adorable Pied Puffbirds and a quiet and secretive Russet-winged Schiffornis. With lunch beckoning we headed back to our parked vehicle. On the way to the truck we picked up another exciting new raptor: a pair of striking Gray-lined Hawks, a species recently split from the Gray Hawk which is found in southern extremities of the US. Our tour began to draw to a close with us wishing fond farewells to our guide for the week, Carlos Bethancourt. The group and I then spent a fun afternoon at the amazing Miraflores Locks. While we soaked up the history of this incredible feat of engineering and listened in awe to the descriptions of the boats passing through the locks, we also carefully tallied 41 bird species from the lock observation deck. These included our first Gray-headed Chachalacas of the tour, nice views of a pair of Bat Falcons and perhaps best of all great looks at a Ringed Kingfisher that was pointed out by one of the lock museum staff. We ended our day with a few cold beverages, another great meal and fond farewells to new friends who were departing early in the morning to catch their flights. This morning there was just enough time to spend another relaxing morning atop the Canopy Tower enjoying breakfast to the sights and sounds of the jungle before having to wish heartfelt goodbyes to the group. Half of the participants made their way to the airport, while others headed for some further adventures in Panama. To summarize, we had spent a wonderful week at this one-of-a-kind lodge with a group of likeminded people who had now become friends. We had been lucky enough to witness amazing birds, intriguing flora and fauna and astonishing spectacles. Over the week the group had tallied an impressive 266 species of birds and seen flights that had tallied over one million migrating raptors. An amazing trip and one that I personally can’t wait to do all over again with Carlos at the Canopy Tower next year! For details on next year’s tour, check my tours page (here). For more photos from the tour check my Flickr page (here). PDF of bird species checklist from the tour (Panama Migration Spectacular Birds 2017). This Saturday (Saturday, 16th) I took off from Dana Point on a pelagic that I had organized for Pasadena Audubon Society. We joined the R/V Sea Explorer on a boat used by The Ocean Institute as part of their educational work. There’s a nice video of the boat in action on Youtube (here). Of course picking up our boat in Orange County meant that we had a little ride before we crossed the Orange Curtain into Los Angeles County waters. That said I think many of our participants were new enough to pelagic birding that we were more focused on seeing birds than worrying about the imaginary lines that divide our county lists. 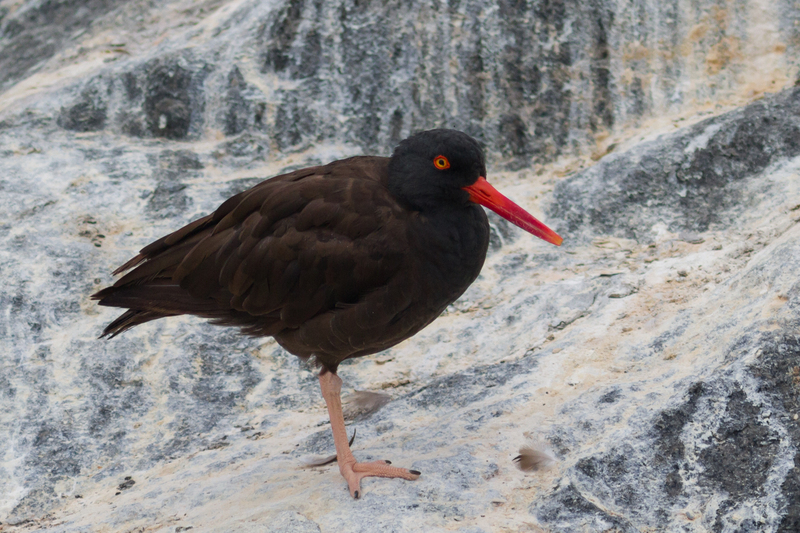 Even before leaving the harbor we had a couple of nice sightings in the way of some Black Oystercatchers loafing on the jetty. Then with jumbo bags of popcorn at the ready we were soon chumming our way out to sea, a steady stream of Heermann’s Gulls and Western Gulls following closely behind us. 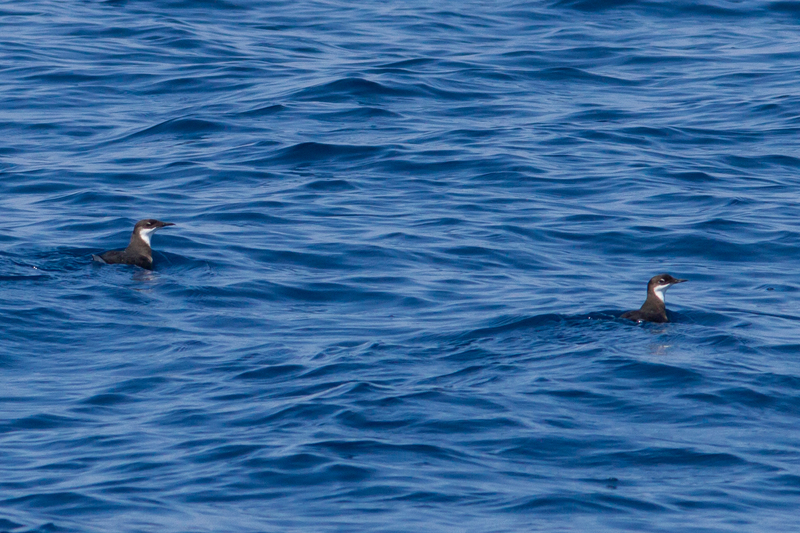 Just off shore we were soon surrounded by our first “pelagic” birds, a nice stream of Black-vented Shearwaters. These birds predominantly nest in Baja California, are generally limited to the coastlines of Mexico and California and tend to like nearshore waters. Among them other shearwaters can be found as well and we soon had a couple of Pink-footed following behind the boat too. 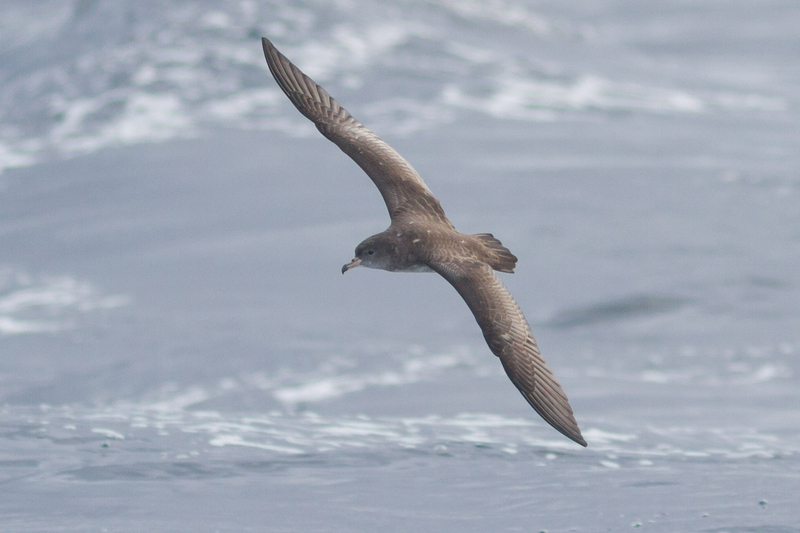 Later we added a couple of Sooty Shearwaters for our third shearwater species on the day. 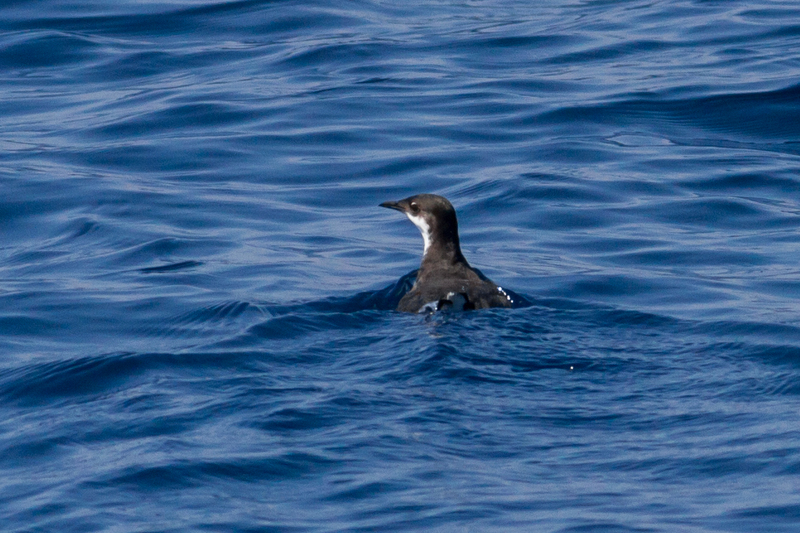 As well as the shearwaters, we were soon picking up our first jaegers of the trip too. Pomarines were probably the most numerous and one very accommodating one decided to follow the boat for a while, allowing people to get good looks at both the structure, flight style and plumage of this rather magnificent avian pirate. We soon added Parasitic Jaeger, though the real highlight was picking up a Long-tailed Jaeger to complete our jaeger sweep. It’s currently peak season for Long-tailed Jaeger migration and though this species is the least commonly found jaeger in Southern California we managed to get two in Los Angeles County. There were plenty of other species to look at as we motored along including Elegant, Caspian and Royal Terns. We even had a few non-avian goodies including Mola Mola and flying fish. That was at least until we got to Los Angeles County waters. As we arrived in LA County it’s as if the bird tap was suddenly turned off (or at least to a trickle). Our flock of following gulls disappeared (probably because I took over chumming) and the fishing boats around Catalina seemed not to be drawing much avian attention. Though sightings slowed considerably, the quality of sightings was good. The next couple of hours included stumbling upon a couple of nice rafts of Common Terns, our only storm-petrel of the day: Black Storm-Petrel, a couple of pretty Sabine’s Gulls and a complete sweep of three jaeger species. Highlight of the whole trip had to be our luck with alcids. Not only did we manage to find a pretty cooperative Cassin’s Auklet, that sat for a while with us, but we also managed to find a pair of much sought after Craveri’s Murrelets. Craveri’s Murrelet has a relatively small population and is one of those birds that is both difficult to find and tough to see well. Typical views are unidentifiable ones of their rear ends, as they take off from the water in front of your boat and Sibley even illustrates them as such in his guide. Amazingly the two, perhaps overly full, Craveri’s we found decided to sit on the water in front of us for over five minutes, This allowed for amazing looks, photos and even better amazing listens! I think this was the first time most, if not all on the boat, had ever heard the insect like twittering of these amazing little birds (listen here). We ended our day heading back along the Orange County coastline where we ran into more Black-vented Shearwaters and a sizable pod of Common Dolphin. 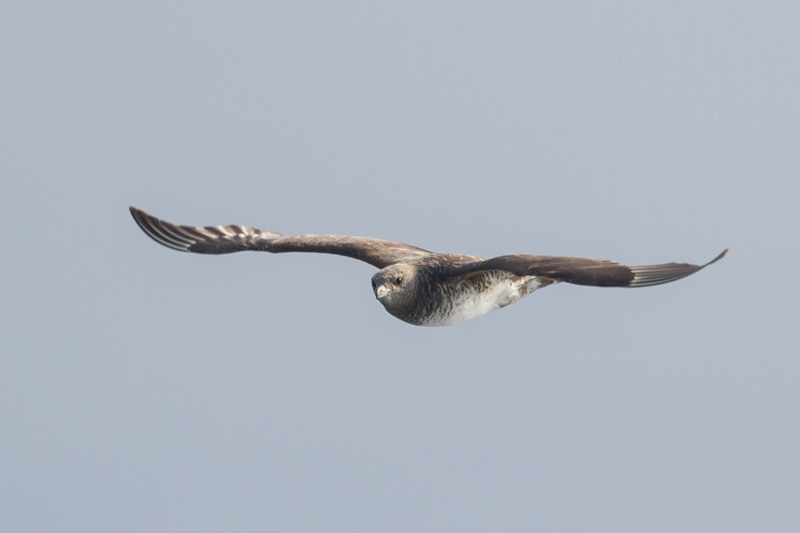 Judging from all the enthusiastic comments from participants I think we need to get another pelagic on the Pasadena Audubon Society schedule ASAP. One of the best parts of the day was that everyone managed to see pretty much all of the birds that we found. This was testament to our excellent boat captain and the fantastic leaders on the day: David Bell, Tom Benson, Kimball Garrett, Brittany O’Connor and Justyn Stahl. Thanks to everyone for making it a fun day on the water. This weekend I drove up from Los Angeles to Sonoma for the Sonoma Birding Optics Festival to go talk about optics for ZEISS Birding (blog here). 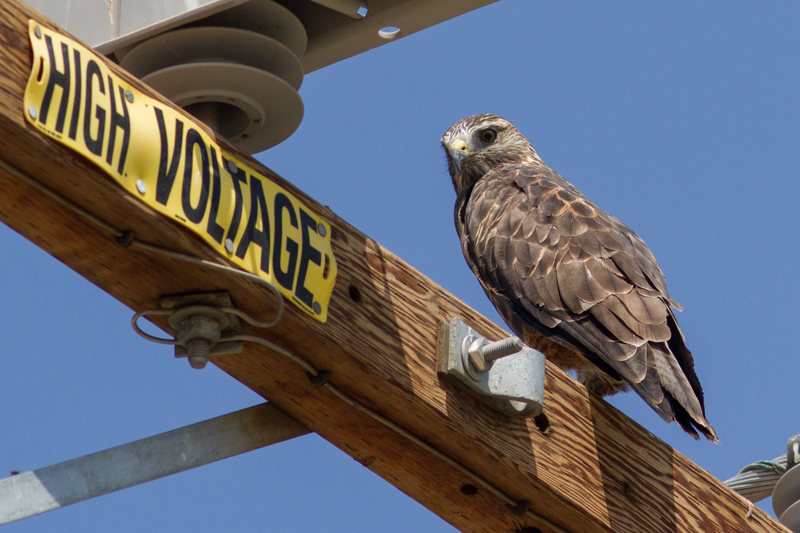 Though I love the incredible diversity of habitat and species in Los Angeles County the one thing it doesn’t have much of is raptor migration. The lack of raptors in migration is almost made up for by the incredible winter raptor spectacle that can be found out in the Antelope Valley in winter (see post here), but for an ex-professional hawkwatcher there is nothing that quite competes with watching raptors on migration. Last Friday I was winging my way north along the somewhat desolate I5 when I spotted some hawks kettling in some Ag fields by the side of the road. I of course got off at the next exit and was excited to find a few Swainson’s Hawks loafing in a field just next to the off ramp. Though it was almost exactly hot high noon and the heat haze and bright sunlight wasn’t exactly optimal for photography I couldn’t pass up grabbing my camera and getting a few record shots of the moment. It’s amazing the individual variation in these beautiful birds and it was nice to be able to study them fairly close up rather than watching them way up in the sky as often happens at a hawkwatch. A few birds even drifted close enough to the roadside for me to capture at least a few different individuals somewhat well with the camera. In October I’ll be in Panama for the peak of this species migration through the country. I wonder if I’ll unwittingly connect with any of these birds again. Other highlights of the weekend trip to Sonoma included Black Swifts, Black Rail, Tule Elk and best of all getting to see some old friends at Hawk Hill Hawkwatch. Los Angeles: Summer in the City? Though breeding season everywhere tends to be somewhat slower for birding than most other times of year, there is still plenty to like when it comes to birding in Los Angeles. 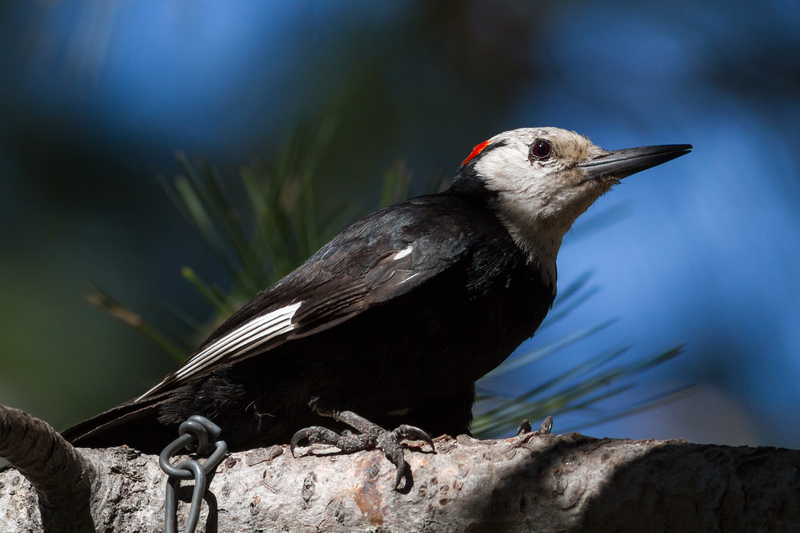 When it comes to summer birding here it’s hard to beat the San Gabriel Mountains, and not just because the elevation tends to provide a little relief from the warmer temperatures to be found down in the basin. Though most people know Los Angeles is in a basin, not many people realize quite how amazing the mountains that surround that basin can be. Less than twenty miles from Downtown, and just about thirty from LAX, one can find oneself seemingly well away from the hubbub of the city. Quickly climbing up in elevation, one can start to find an array of exciting mountain specialties including Bell’s Sparrow, White-headed Woodpecker, Green-tailed Towhee, “Thick-billed” Fox Sparrow, Lawrence’s Goldfinch and more. At night the mountains and foothills can come alive with owls and goatsuckers, which when you include rarities, can include up to seven species of owl. As well as the more common species these might include such sought after goodies as Spotted Owl and Flammulated Owl. One owl often more easily found during the day is the tiny, but fierce, Northern Pygmy-Owl. 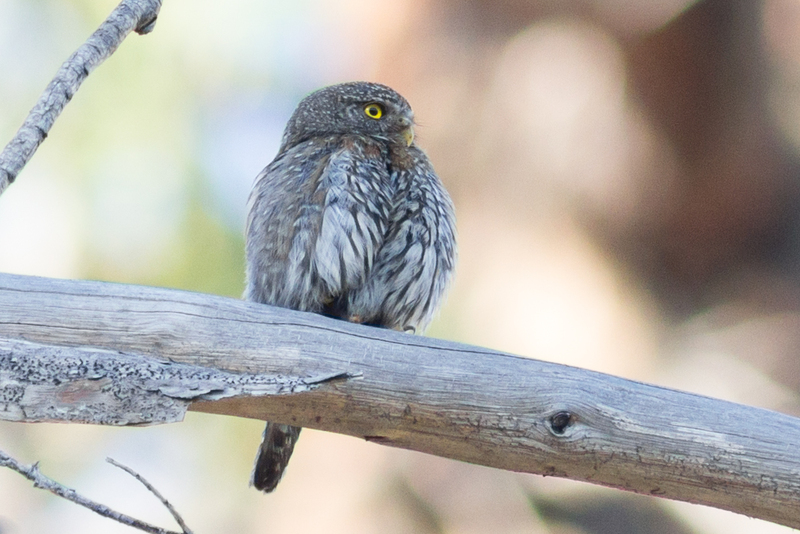 I love pygmy-owls anyway, but the potential for this bird to be split from those Northern Pygmy-Owls found in the Rocky Mountains adds to the interest. 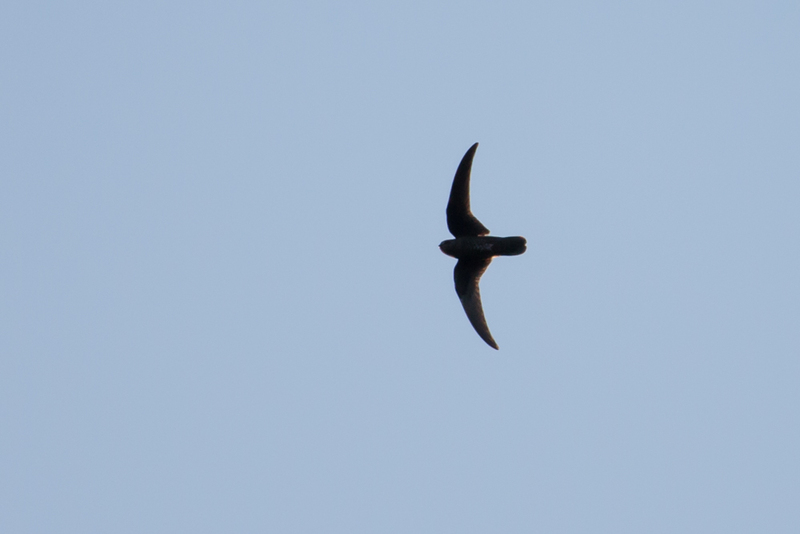 One of North Americas most enigmatic and sought after species can also be found in the Los Angeles area: Black Swift. This highly specialized aerial acrobat breeds in just a handful of spots in Southern California, due to a reliance on waterfall nesting sites in what is a relatively dry region, but at least one pair is relatively accessible from Los Angeles. Every July I take a group out from the local Audubon group to enjoy seeing this neat species. Perhaps even more elusive and desirable, summer is not the worst time to be looking for Mountain Quail. 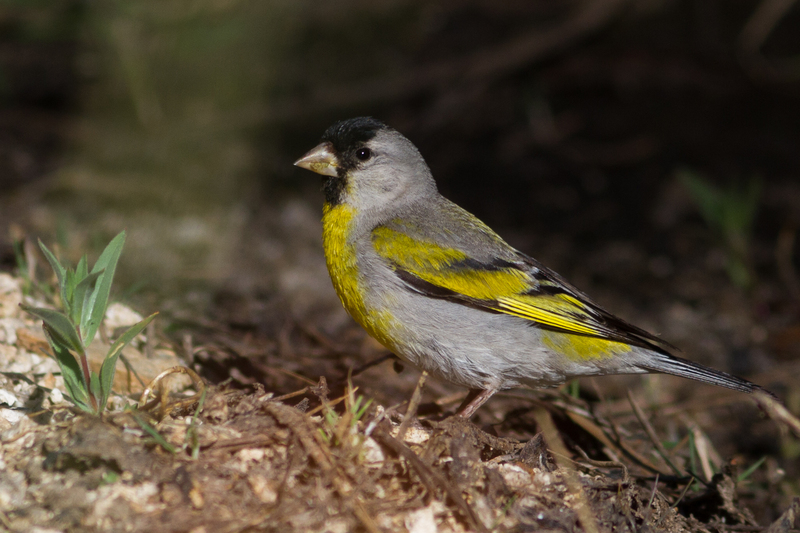 Though they are a little easier to find earlier in the year when the birds are still vocal, they can be found in the warmer months too. In fact the best photographs I ever captured of these sneaky little quail were in July. This may just be a coincidence, but I suspect it was because the birds were at least somewhat focused on maintaining contact with chicks at the time rather than what I was up to. Though I love migration more than any other time (who doesn’t? ), I have to say I’m thankful for all that summer birding in Los Angeles has to offer. It’s always amazing to me that you can escape a population of 19 million people and find yourself alone and surrounded by birds just a hop, skip and a jump from downtown Los Angeles.